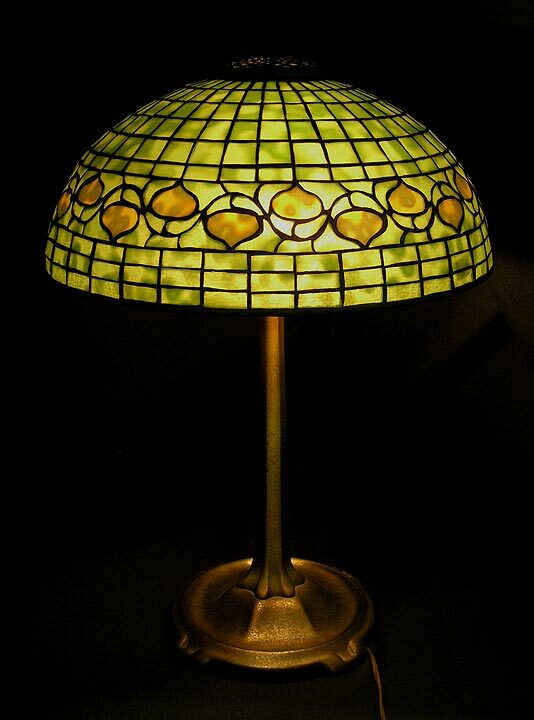 This is another one of my recent purchases of Tiffany Favrile floor lamps. This example has some wonderful features. First it has a gorgeous 10" diameter green Favrile shade with gold iridescent spider web decoration on the top and a border of gold iridescent hooked feather decoration. The base has removeable accessories that include a drink tray and a magazine rack. The condition of the shade is mint and the base is excellent, with a rich green-brown patina. The shade is signed "L.C.T. Favrile", but is very difficult to photograph. 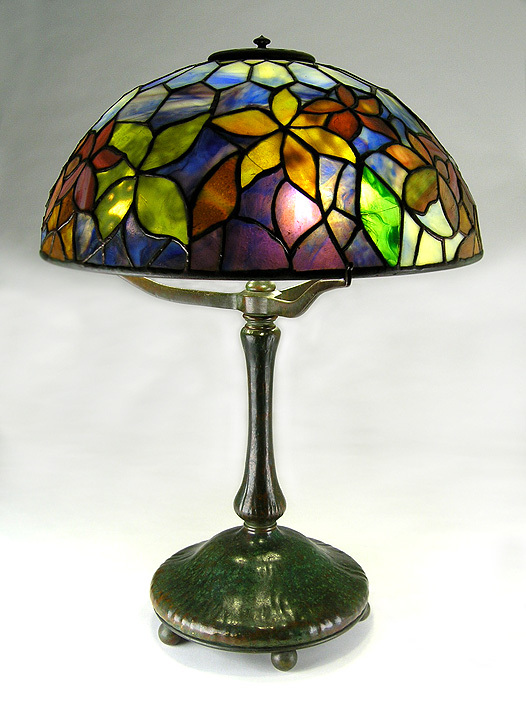 The base is signed "TIFFANY STUDIOS NEW YORK". 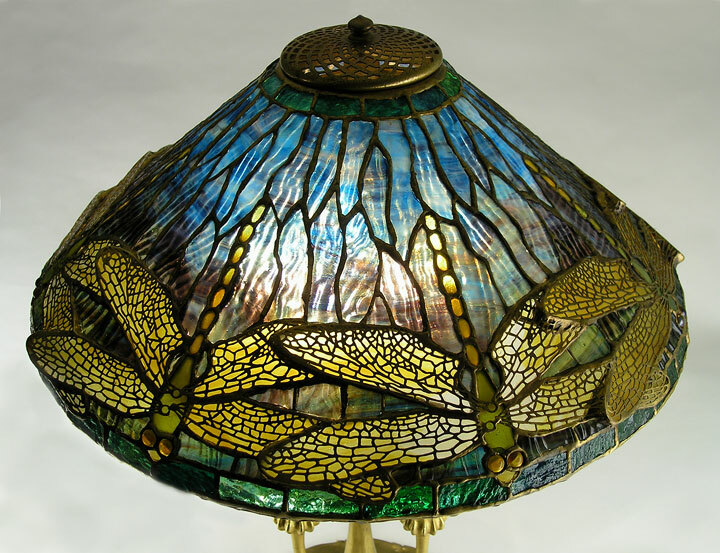 I recently had several Tiffany lily lamps for sale and then sold them all, so for a while I had none. I'm pleased to say that now I have a good one. 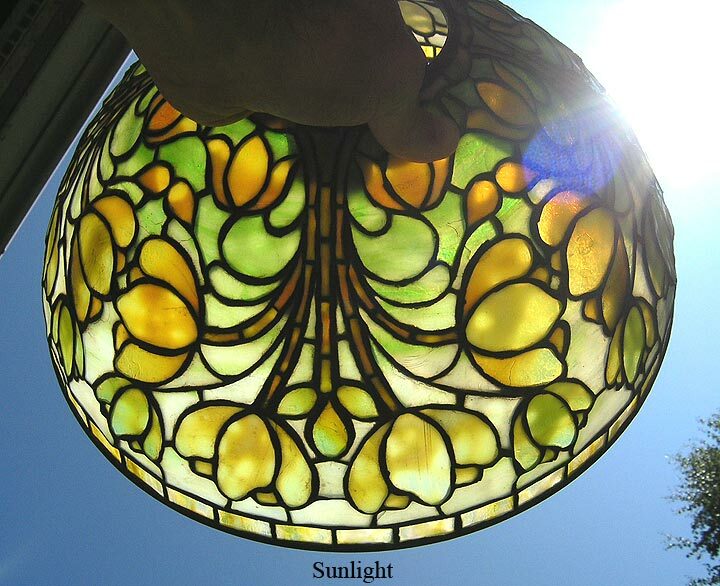 It's a wonderful 10-light, with matching shades and a really gorgeous patina. Those are the two most important qualities to look for and this lamp has them both. The base and all of the shades are signed. The lamp is as nice an example as you could ask for. For the best collections! 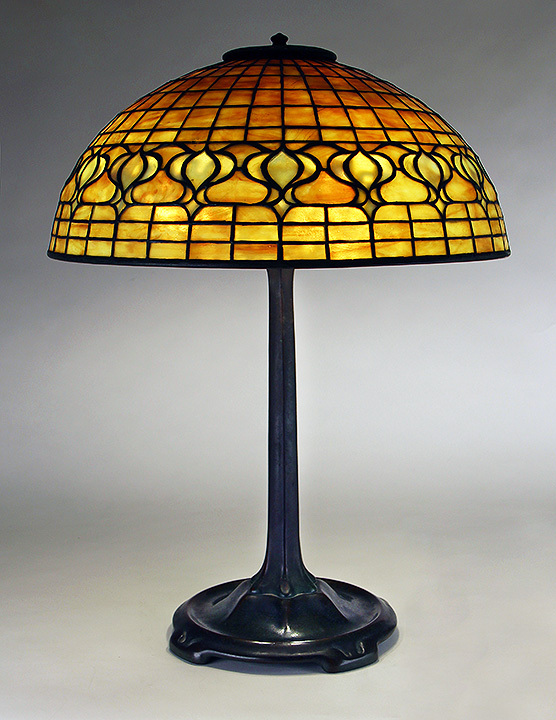 This model lamp was called Arabian by Tiffany Studios. The decoration is zipper pattern. This model, in tan, is particularly nice because it's totally original, including the socket (but not the wiring, which is new and electrically safe). The color match between the shade and base is excellent. 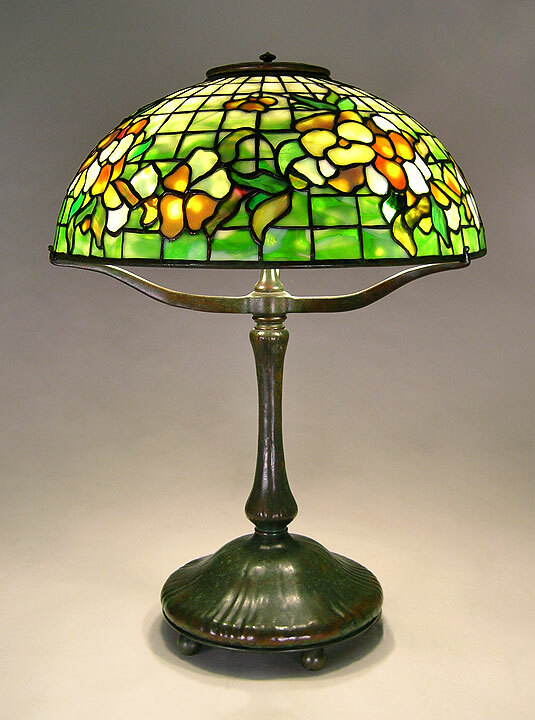 It's properly signed L.C.Tiffany - Favrile on the inside lower rim of the shade, as well as on the underside of the base. 14¼" tall. Mint condition. 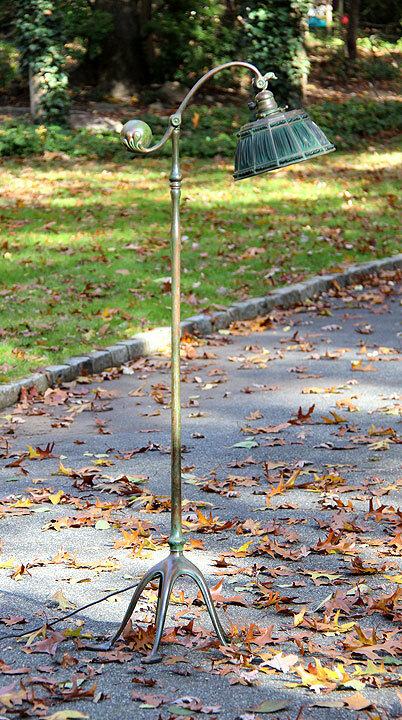 If you've been looking for a wonderful example, with no excuses, this lamp is for you. I'm excited to have just acquired this lamp. As most of you know, blue Favrile shades are very rare. This one is a beauty, fully decorated with rare spider webbing. The shade is fairly opaque, so the color of the blue does not fade when illuminated. It looks almost identical on and off. 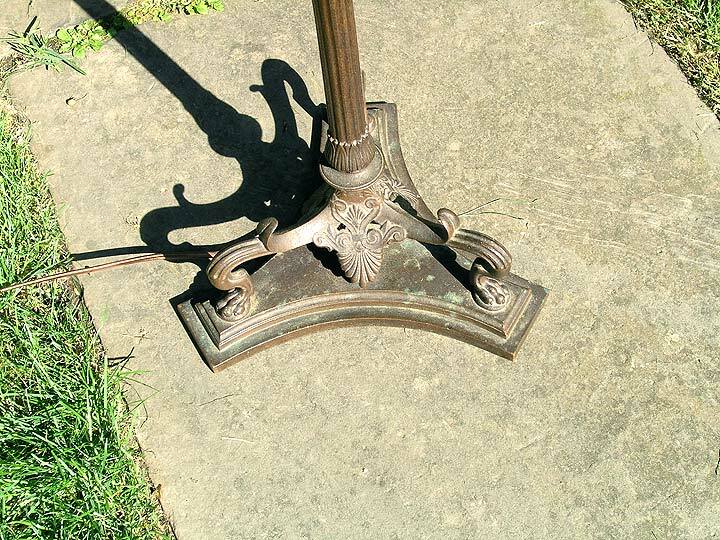 The base has a fancy decorated column and foot with a gorgeous original patina. It's one step up the ladder of sophistication and rarity. Overall, this lamp is the cat's meow. Fully signed shade and base. 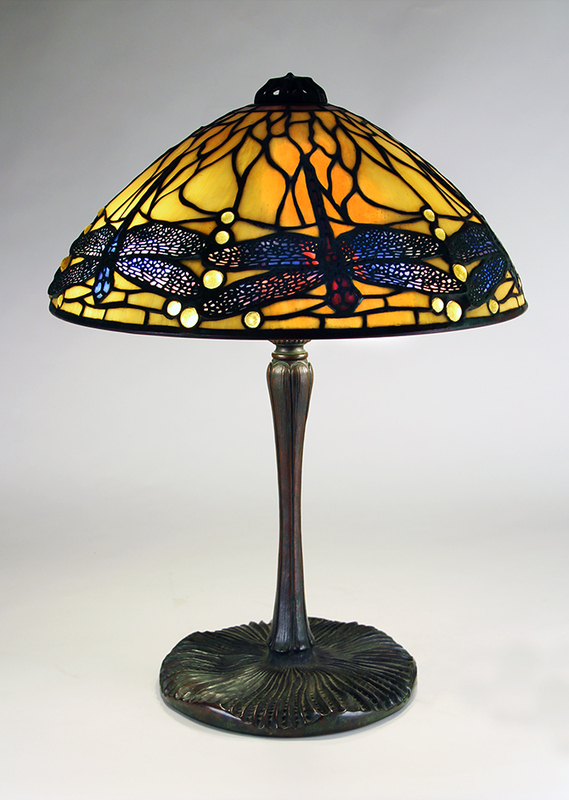 Are you aware that the last blue Favrile lamp to come up at auction (Sotheby's New York, December 18, 2008) sold for $40,000 + 25% buyer's premium, for a total of $50,000? 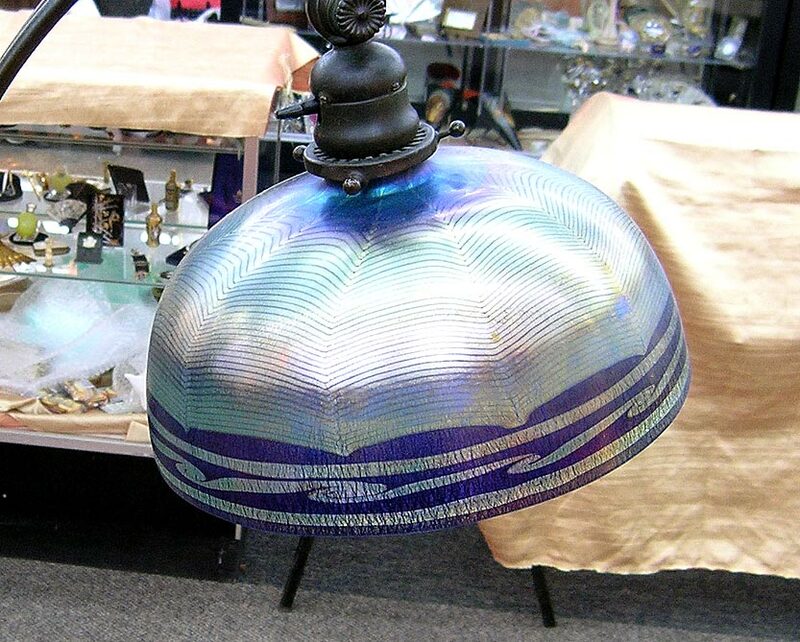 Click on this link: Sotheby's blue Favrile lamp. That lamp had several large fitter chips and a very ordinary base. This lamp is a better lamp at a much better price. It won't last long. Blue Favrile shades are the cat's meow. They're beautiful and they're rare. 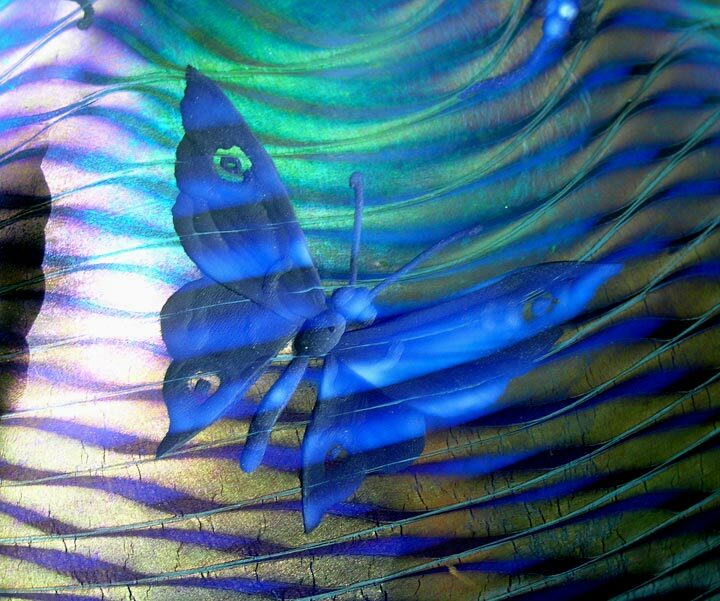 This great example has excellent blue color that stays blue when lit. Add an intaglio-carved insect, and you've got one special shade. The counterbalance base is very desirable especially with a great patina. Great condition. Signed shade and base. 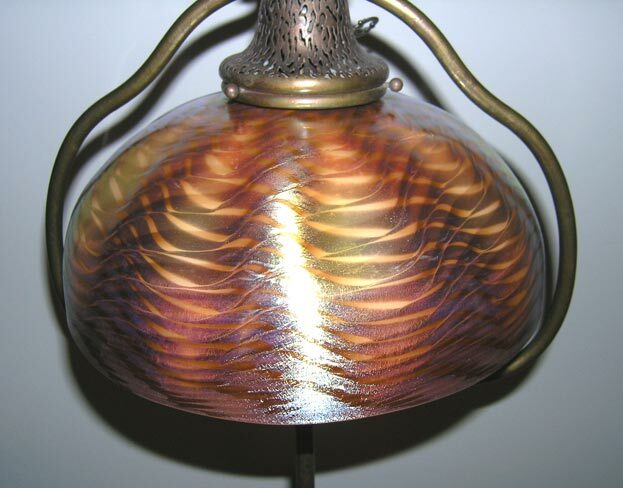 The 10" Favrile shade on this lamp is wonderful and different than the typical shade, because of two reasons. First the wave decoration has blue color, instead of the usual green. That alone makes the shade special. Second, the shade is unlined, so it lights up warmer and brighter. The base is a very desirable model, with a wave decorated foot, in very nice condition. Overall, the lamp has no excuses. The shade is very beautiful, fully signed and in extra mint condition. The base is fully signed and in excellent condition. 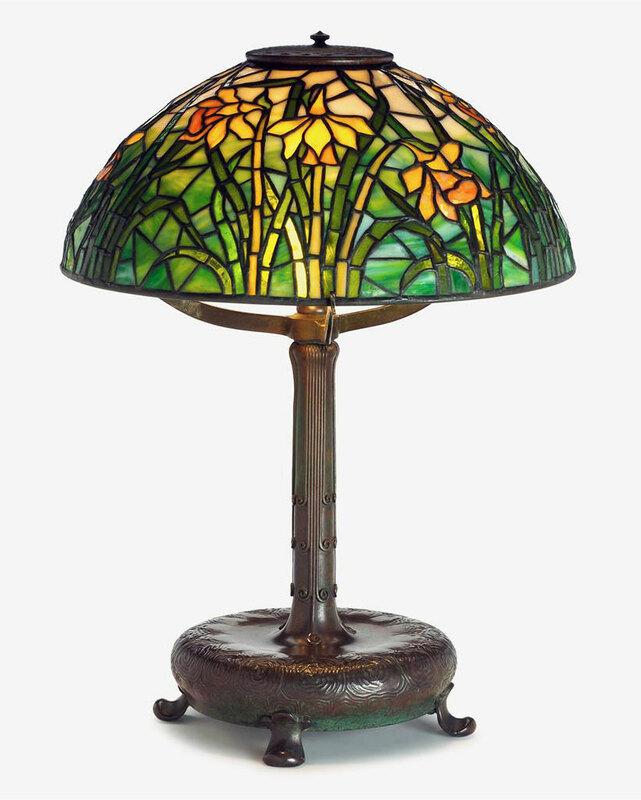 If you're looking for a Tiffany Studios floor lamp that's a cut above the usual, this lamp is for you. Tiffany Favrile shades really do vary in quality. This shade is evidence. 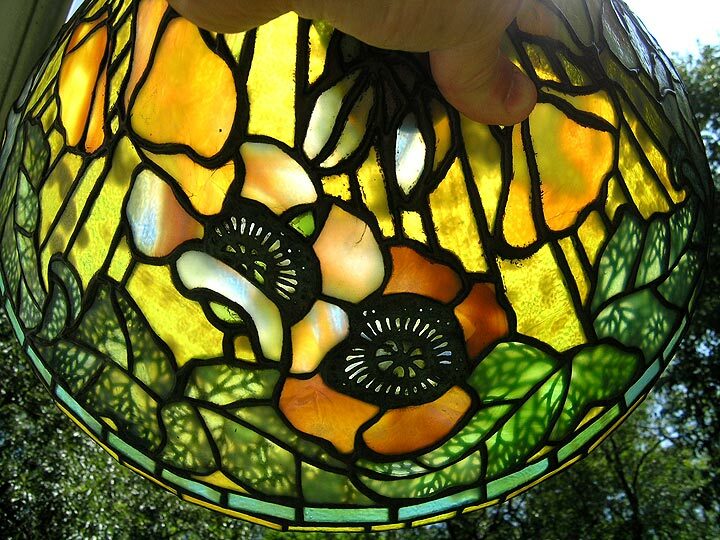 The color is wonderful, the ribs show nicely, and there are two gorgeous intaglio-carved dragonflies. Favrile shades don't come much better. 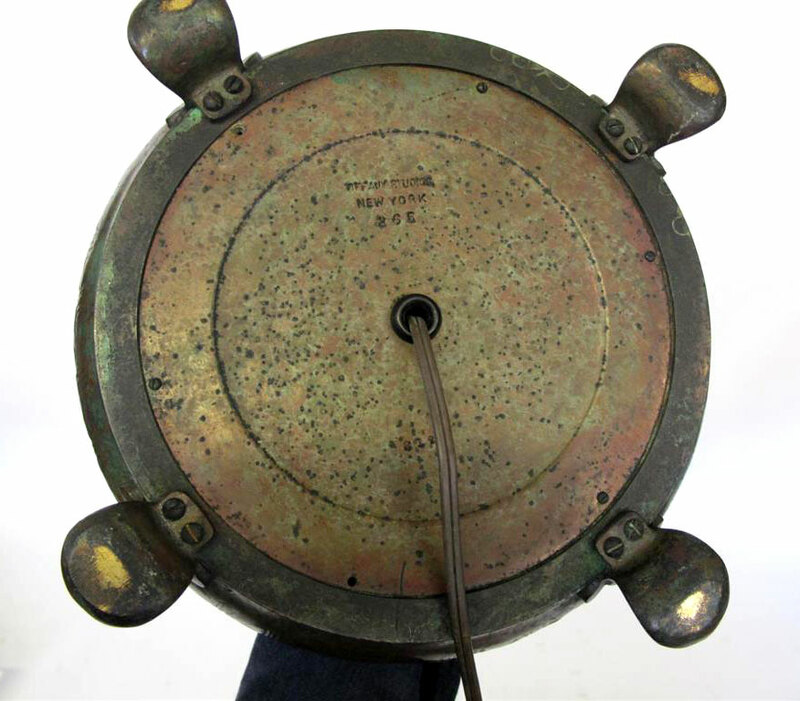 The counterbalance base is exceptional too, with an original rich green-brown patina in superb condition. Most people prefer the counterbalance base to the harp base. 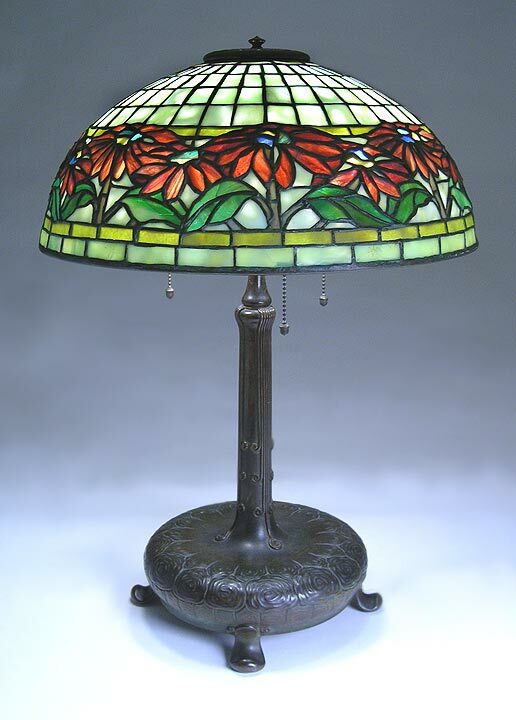 Other than one very small chip to the fitter rim (completely hidden and only mentioned for accuracy), this lamp is a gem. 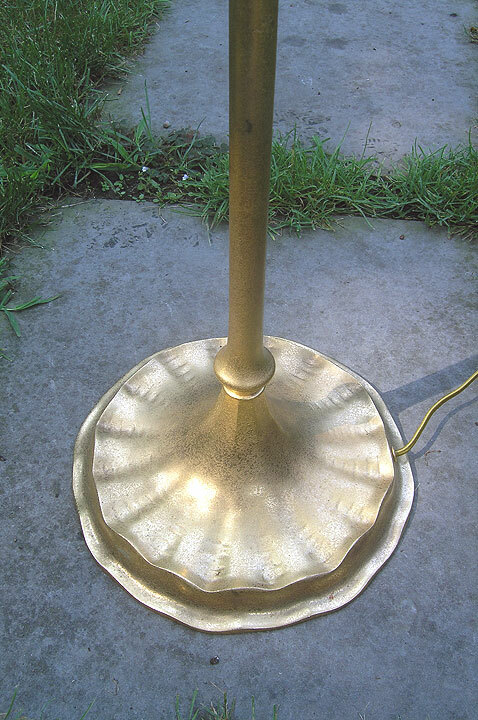 10" diameter shade, approximately 58" tall. Signed shade and base. 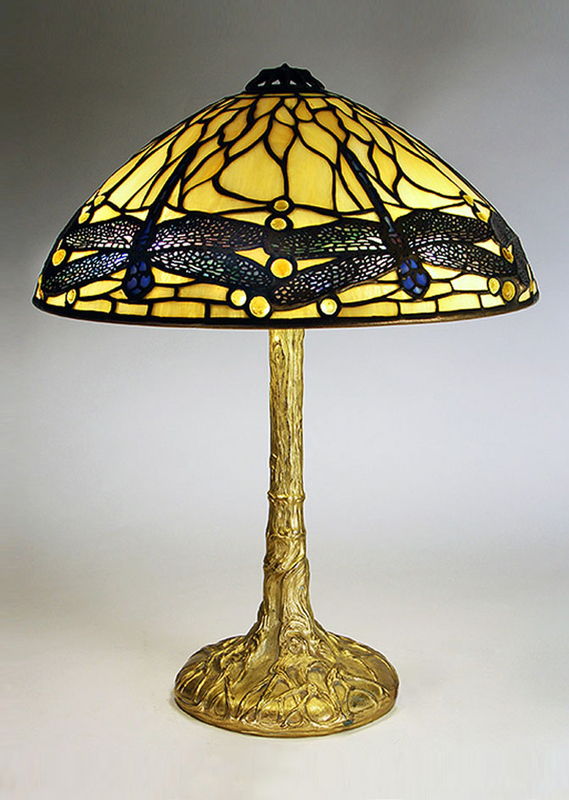 I sell Tiffany floor lamps very quickly, so make your decision soon, before it's gone. 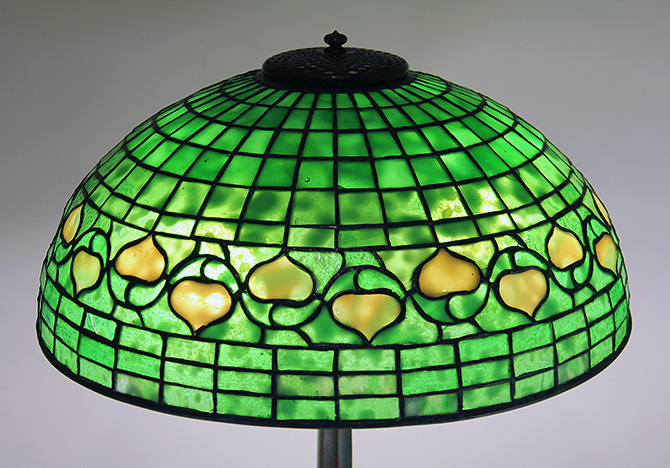 There is a big range of quality in Tiffany Favrile glass shades. This example is killer. The colors are very rich, with incredible rainbow iridescence from purple to red to green. (Make sure you click on the thumbnail photo at left to see closeup photos of the shade.) The spider web decoration is very rare and very desirable. 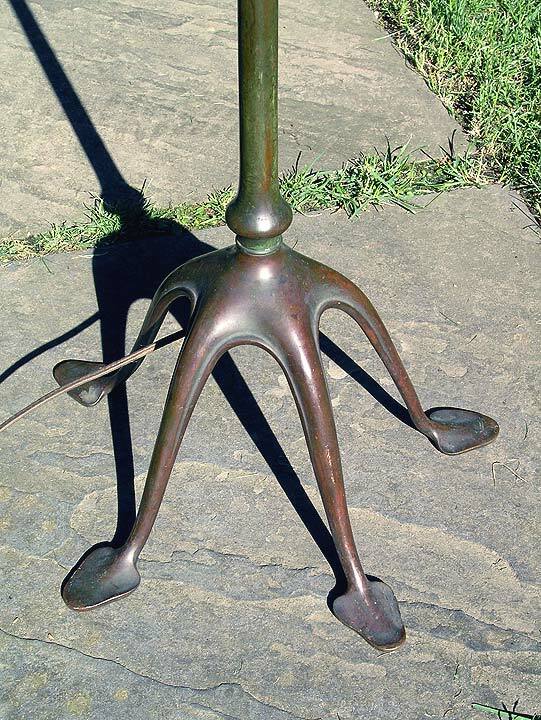 Couple that with a mint patina counterbalance 5-legged base, and you've got one great lamp. The shade condition is extra mint, including the fitter rim. Signed both shade and base. 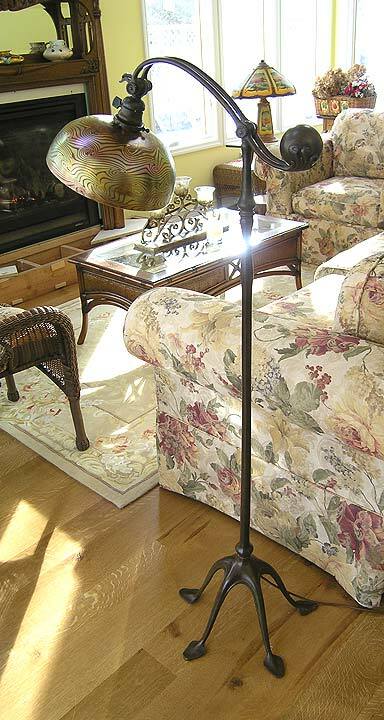 This is such a nice example of a Favrile floor lamp. 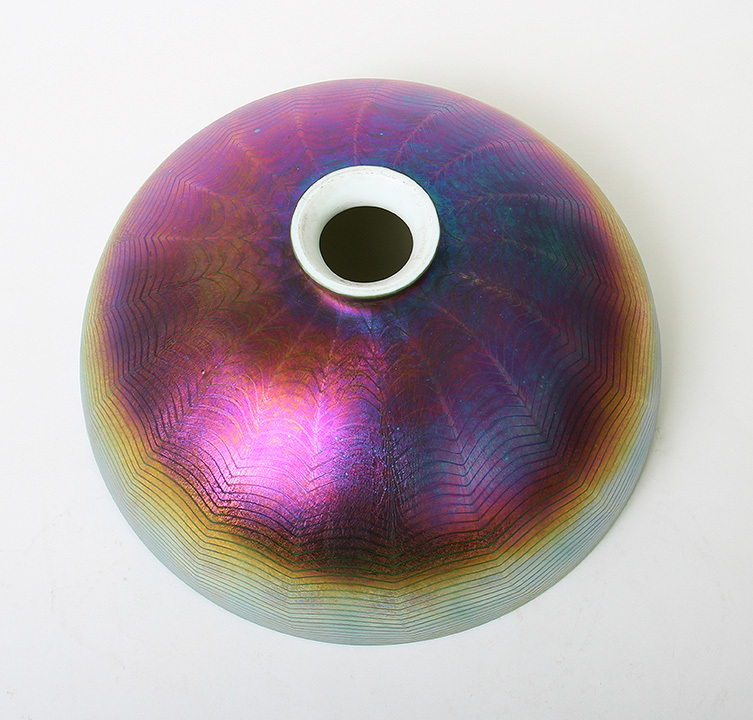 The shade is 10" in diameter with superb decoration and great iridescence. The harp base is the very desirable variation with a decorated column and platform, in the statuary bronze doré finish. All in all, a great package in great condition, fully signed on the shade and base. 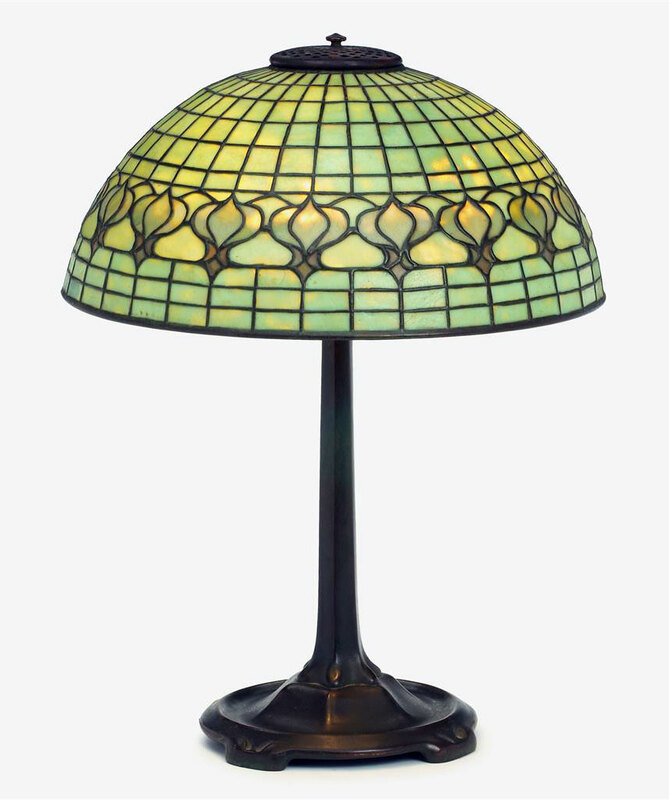 I've recently been lucky enough to purchase several excellent Tiffany Favrile floor lamps. This is one of the examples. 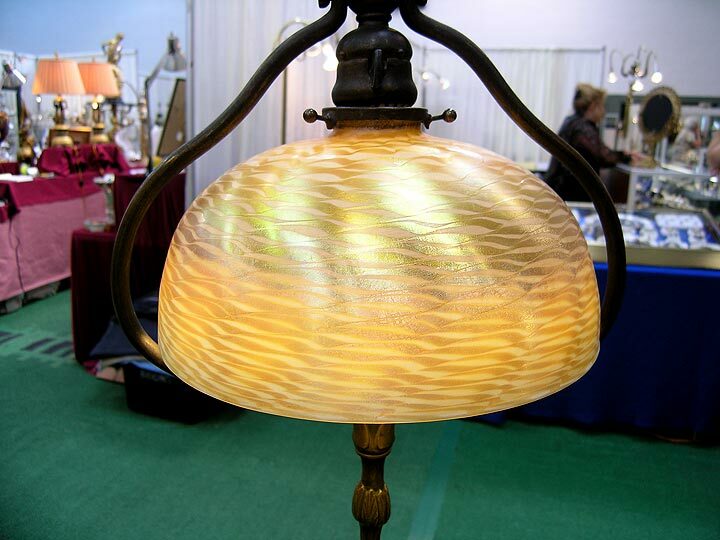 The shade is 10" diameter in a rich butterscotch color, with strong ribbing that shows especially well when lit. The base is a bronze harp, with a wonderful wavy base and a gold doré finish. 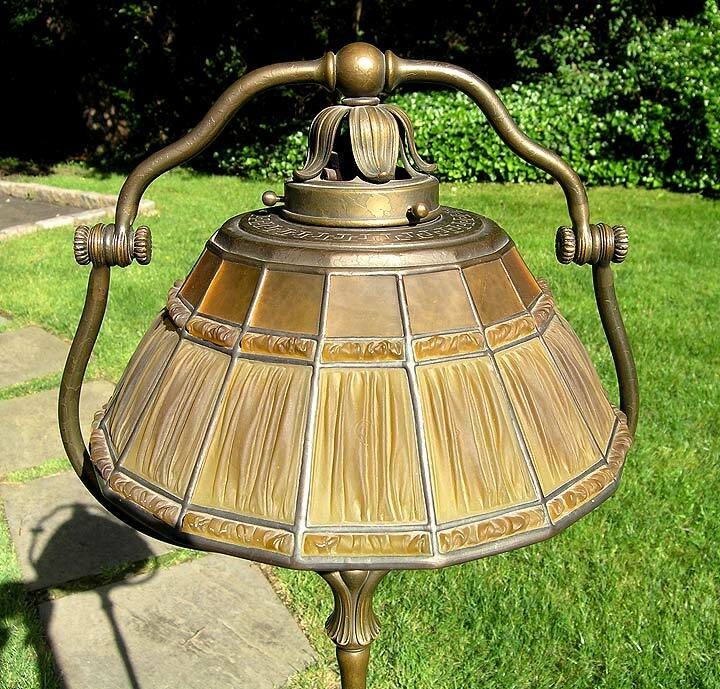 The condition of the shade is excellent except for two very small chips on the fitter rim that are completely hidden when attached to the lamp. Additionally there are two tiny air bubbles on the surface, both original. One is open and the other is closed. They're unimportant and only mentioned for accuracy. The finish on the base shows some wear commensurate with its age. The shade has an engraved signature on the fitter rim "L.C.T." 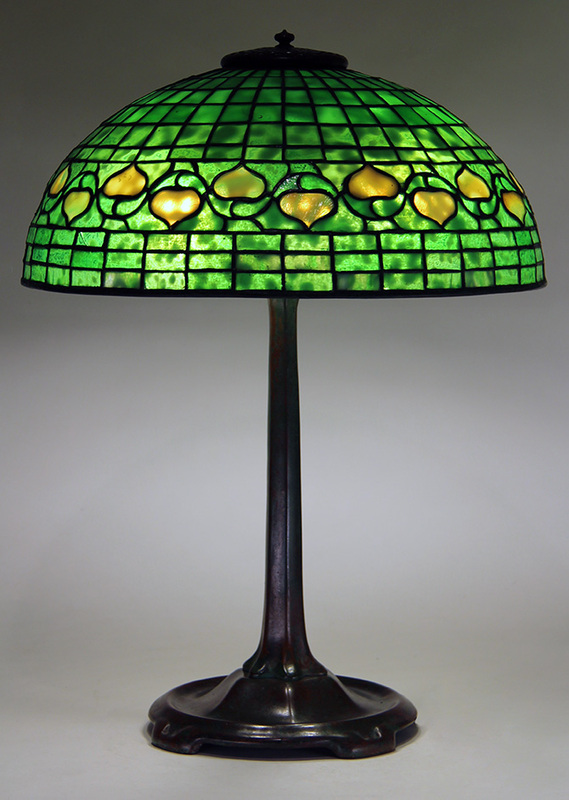 and the base is signed underneath "TIFFANY STUDIOS NEW YORK 682". Here's why I love this lamp. First it's got the very rare and desirable Alladin floor base, which is very heavy and not about to tip over. It has an adjustment knob to raise or lower the arm, but I'm not sure why anyone would want to do that, but at least you can. Next it's got a gorgeous 10" diam. gold Linenfold shade with rich color. 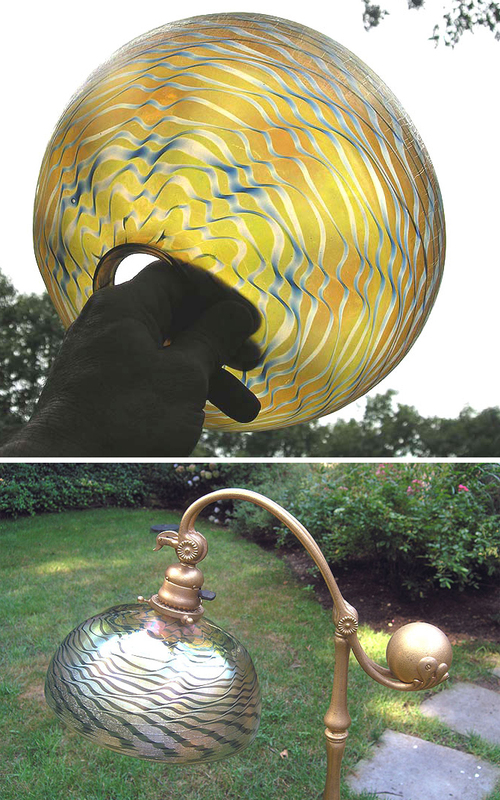 Click on the thumbnail photo on the left to see several photos of this special lamp. Beautiful condition. Signed shade and base. 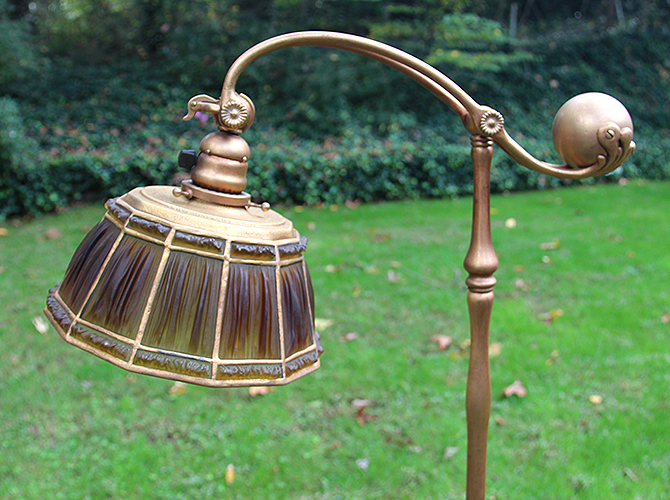 The shade on this floor lamp is exceptionally pretty, with excellent detail and color. It's in mint condition and properly signed. 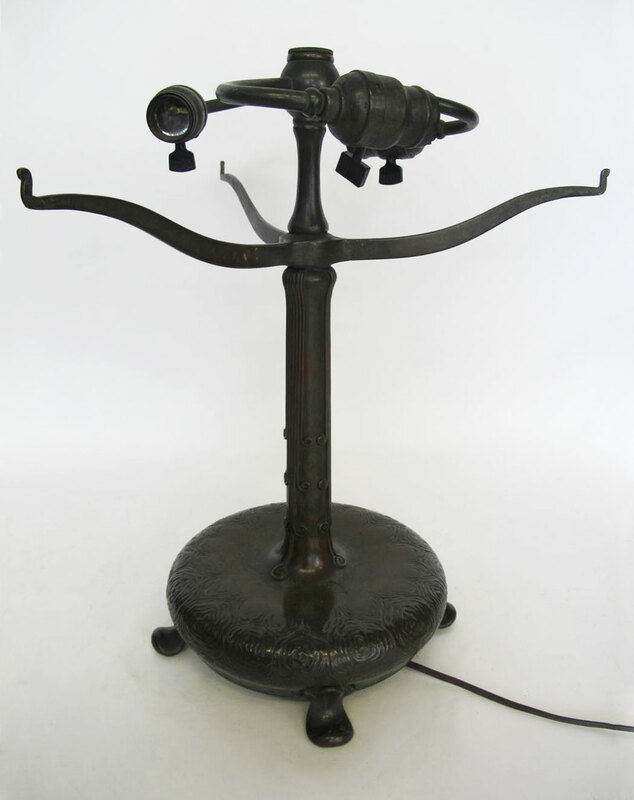 The very desirable counterbalance floor lamp is 5-legged and comes with a very nice original patina. It too is signed. All in all, a very fine lamp. 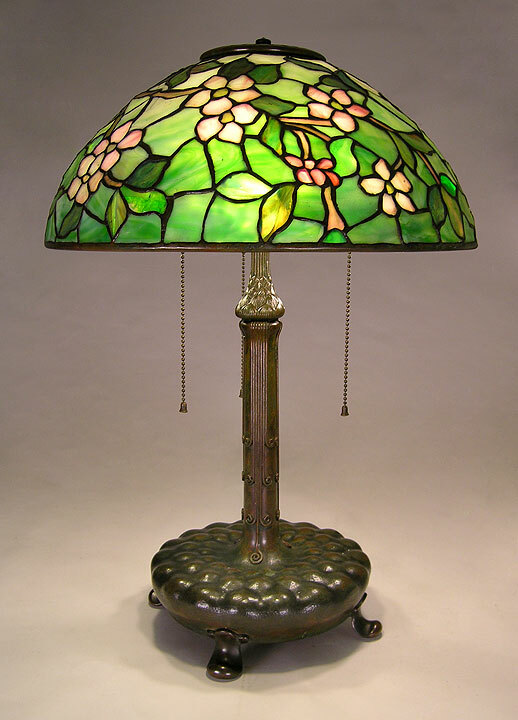 Everyone likes Tiffany Studios Linenfold lamps, so take a close look at this one, because it's special. 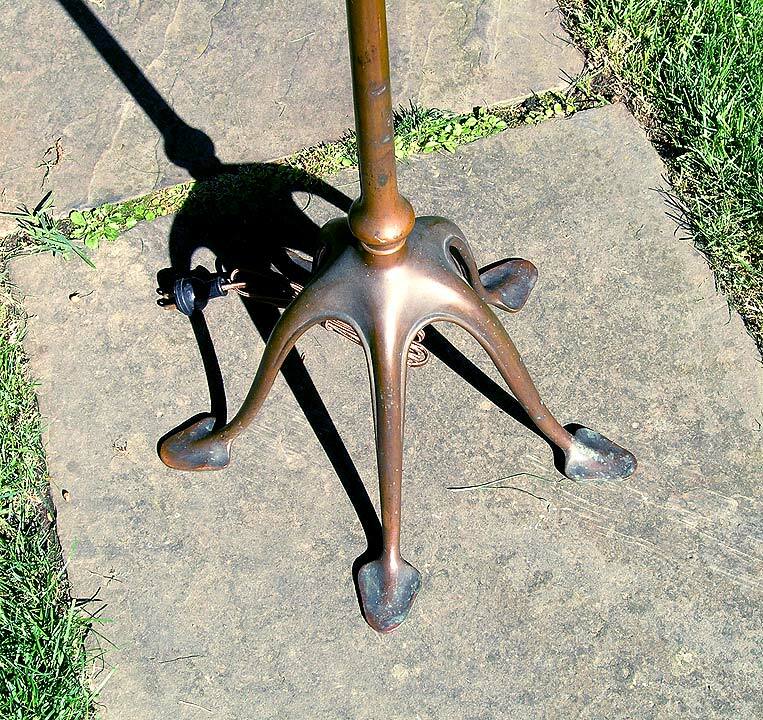 Second, the very desirable counterbalance floor base has a superb original green-brown patina. 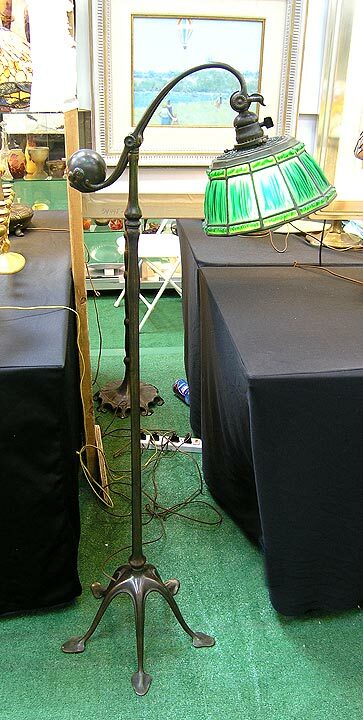 This is a no excuses lamp in very fine original condition. There are no cracks or damage to the shade at all. The patina on the base is very rich, with only a few minor rubs or scratches, commensurate with its age. The lamp is fully signed on the shade and base. This lamp will not last long, so act soon to avoid being disappointed. Just got this beauty. Green Linenfold shades are much rarer than gold shades. This shade is super mint with a couple of rare and desirable variations. The first variation is that the green color in the upper and lower borders are the same but different than the large panels in the center. The second variation is that on the top of the shade there is beautiful random applied threading. Just a super little added touch. 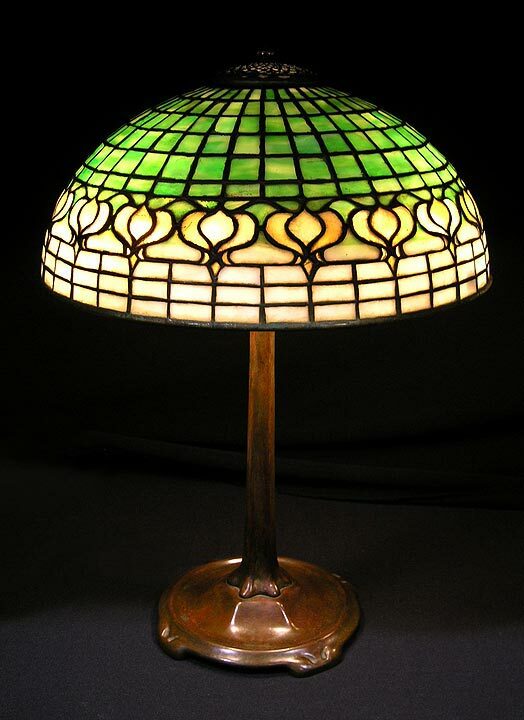 Everyone seems to like Tiffany Studios Linenfold lamps. 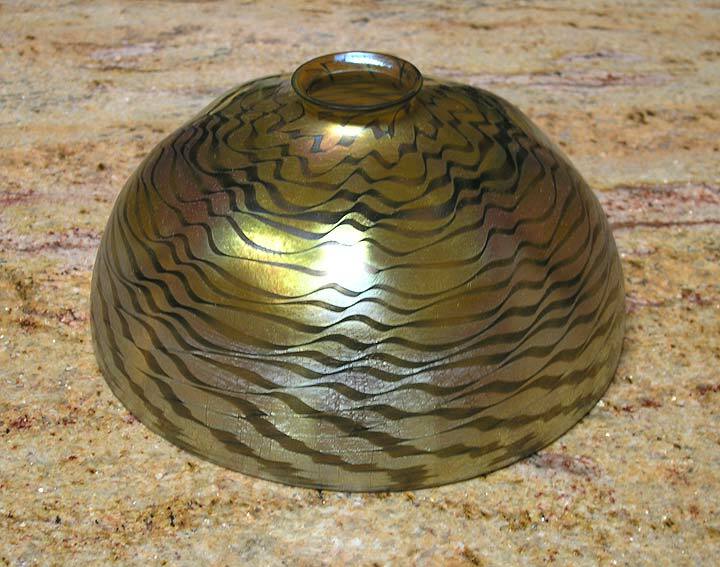 This example has a 10" diameter shade with rich gold coloration. 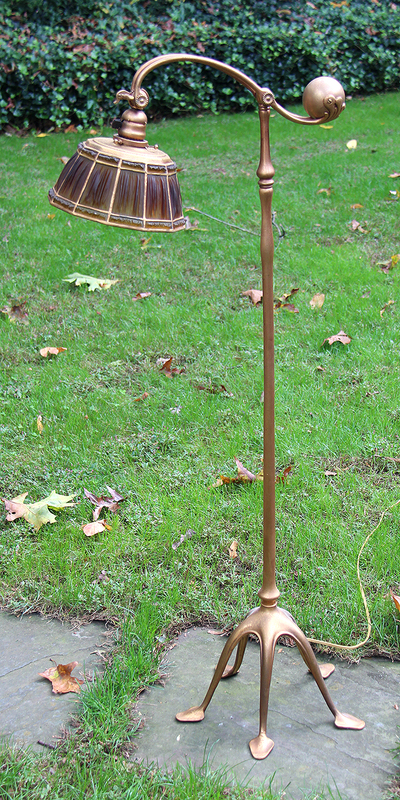 Both the base and shade are finished in gold doré which is in very nice condition. There are no cracks in the shade and there has been no repair. Signed on both the shade and base. It's a very fine example for discriminating collectors. This lamp is killer. It's only the second time in many years that I've owned this important 10" Linenfold lamp with elaborate decoration and hoof feet. A truly outstanding example with great color in the shade. 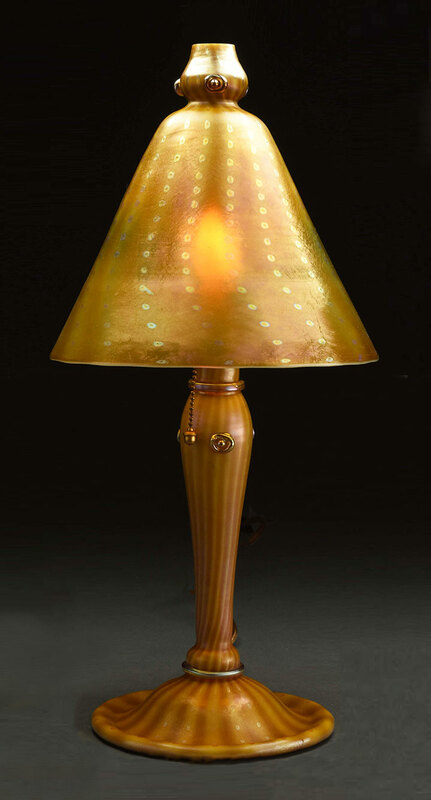 The gilding bronze base is bright and original. Just a super lamp for the best homes. Signed shade and base. Most Favrile shades have wave decoration. This example has King Tut decoration, also known as Damascene. 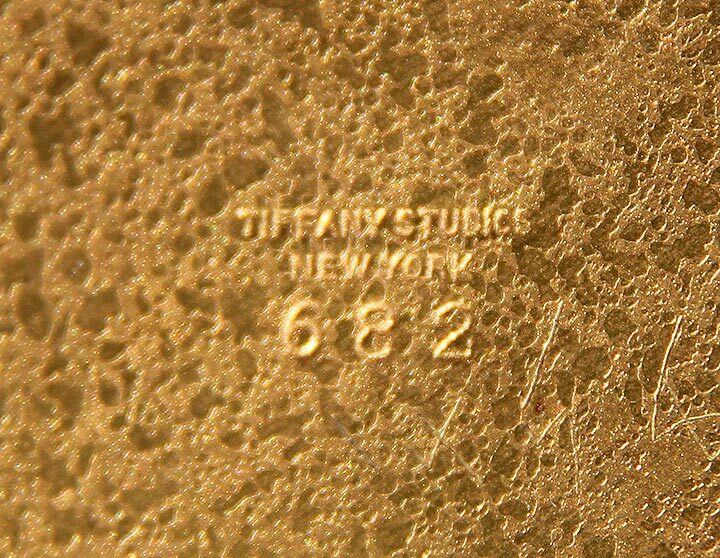 It's rare to find this decoration on a Tiffany 10" Favrile shade. This particular shade has really special color. The gold is so rich that it's really a brown shade with gold King Tut decoration and strong red iridescent highlights -- just spectacular. 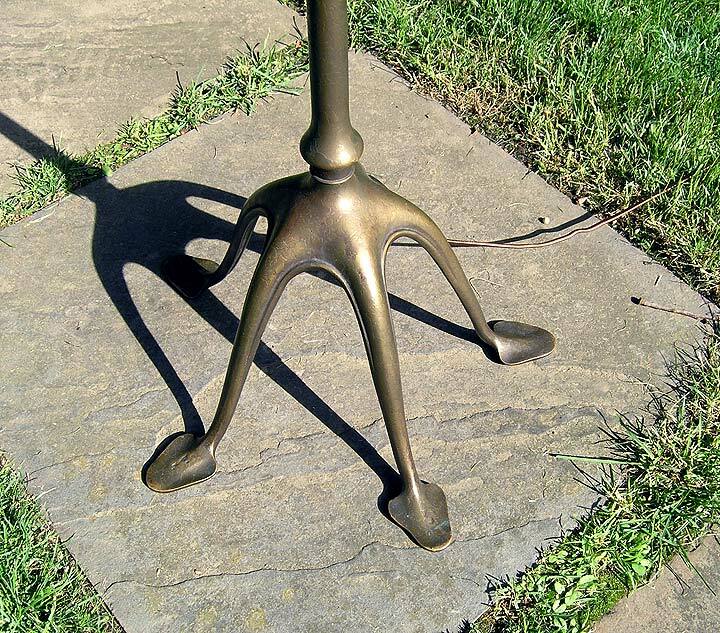 The base is a classic five-legged counterbalance with very good patina. Excellent condition. Signed shade and base. 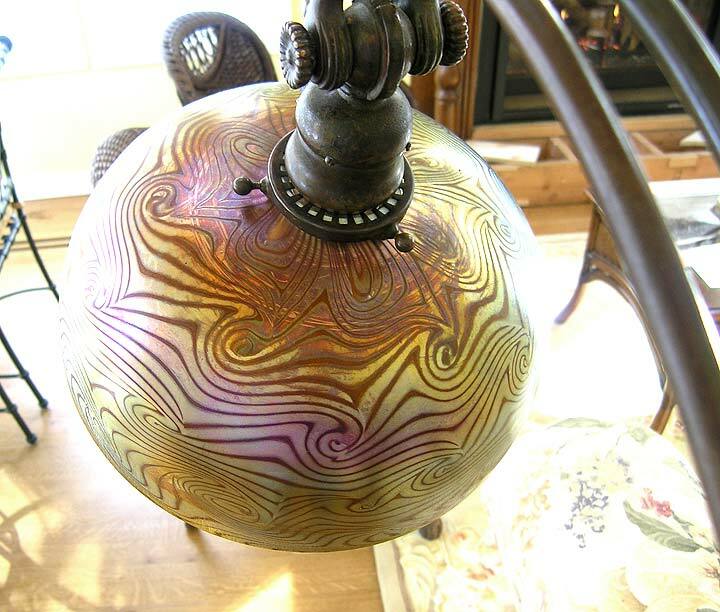 When I bought this lamp, the base was nearly black with years of accumulated grime. Luckily, the dirt protected the original gold doré finish underneath. Cleaning revealed it was in superb condition. 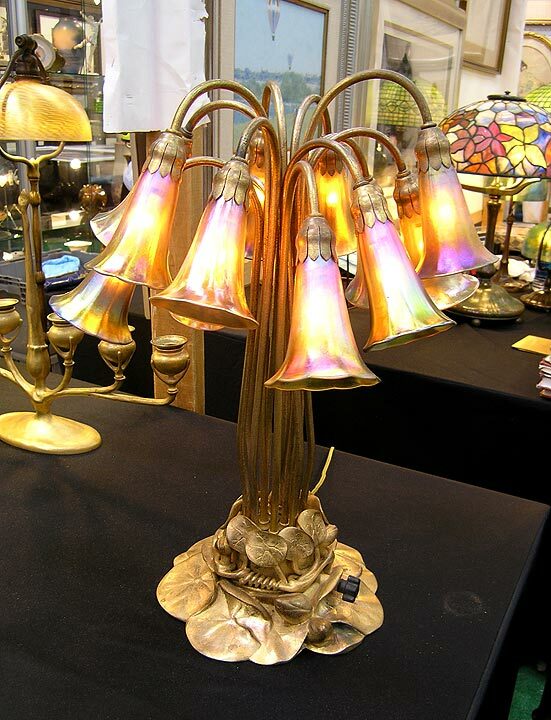 Add 10 gorgeous Favrile shades with great iridescence, and you've got one great Tiffany Studios lily lamp. All of the shades are signed (as well as the base) and in mint condition except for one flea bite out of the fitter rim of one of the shades. 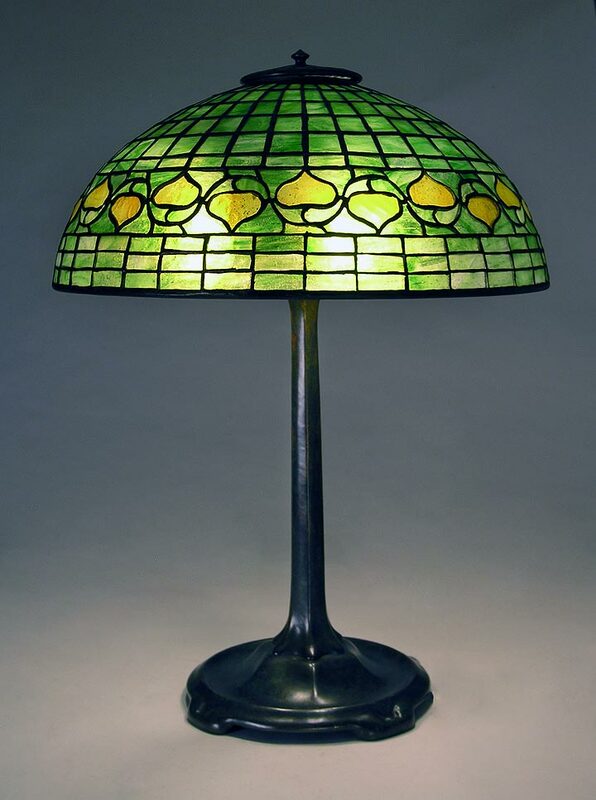 Tiffany didn't make many smaller leaded glass floor lamps. Most of the smaller ones are either Favrile glass or Linenfold. 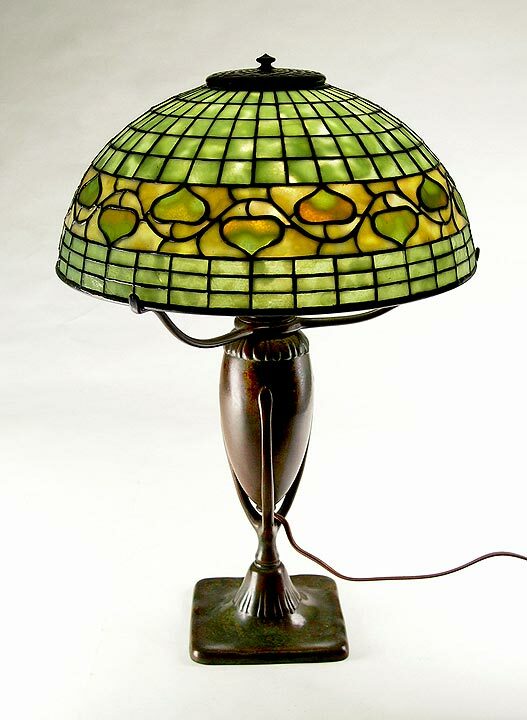 This exceptionally pretty lamp has a 12" diameter Acorn shade with beautiful apple green color and excellent mottling. 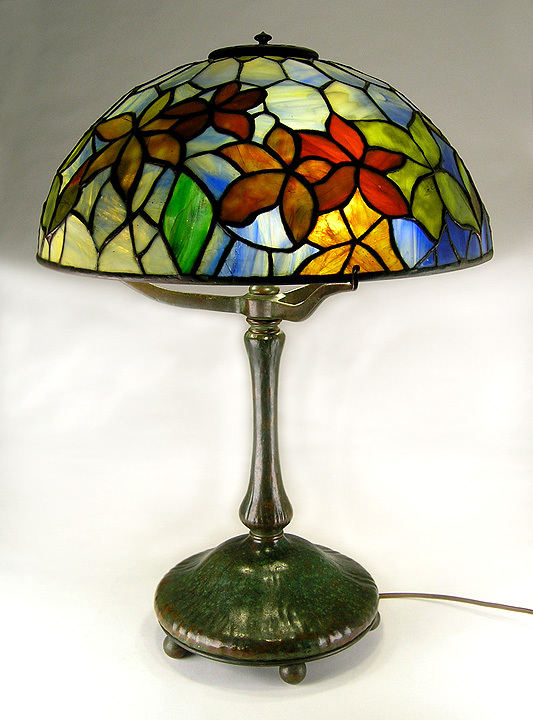 The colors show well when the lamp is lit (see the additional photos by clicking on the thumbnail photo at left). This is a superb example. Super condition. Signed shade and base. Let me try to list the ways that this lamp is incredible. 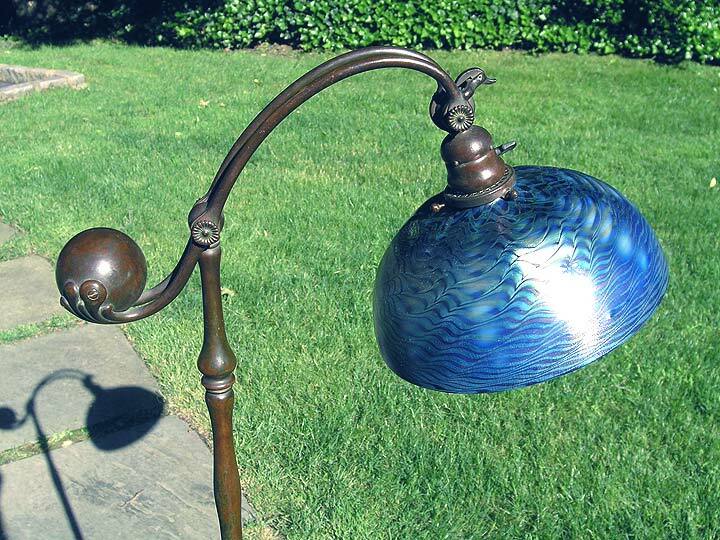 First, it's blue and blue Favrile lamps are rare and very desirable, the bluer, the better. Second, it's 12" in diameter. Most examples are smaller, either 10" or even smaller. Third is the wheel-carving of butterflies, flowers and vines. Most examples have no carving at all. This one has beautiful carving. Some blue shades lose their blue color when lit. Not this one. The base is called a double harp because there are knuckles on the left and right that allow the shade to swivel. The patina is rich, beautiful and original. 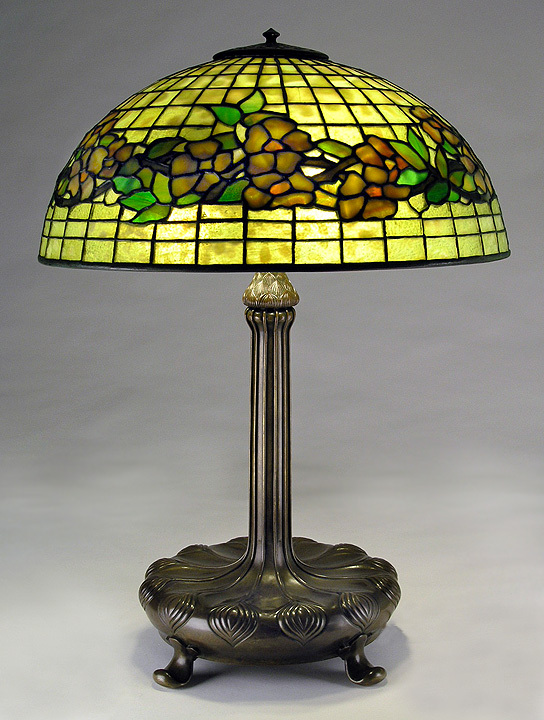 The lamp is signed on the shade and base and is for the best collections. It would be hard to find a finer example. Mint condition. 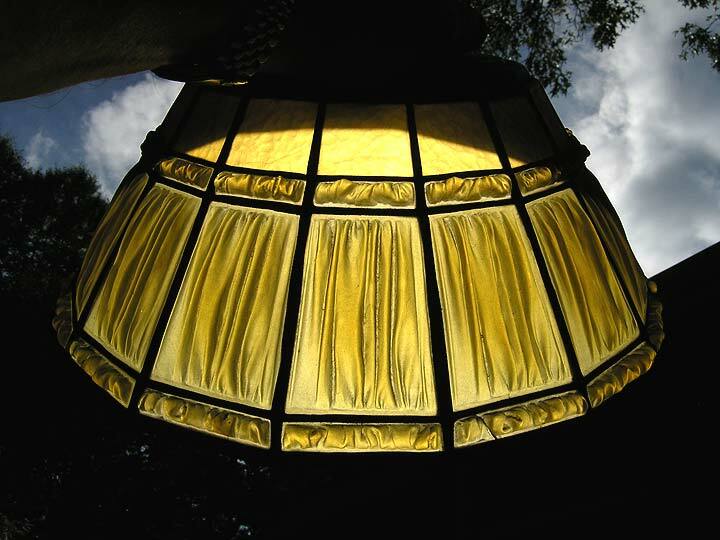 12-light lily lamps are the largest size available except for the 18-light lily. 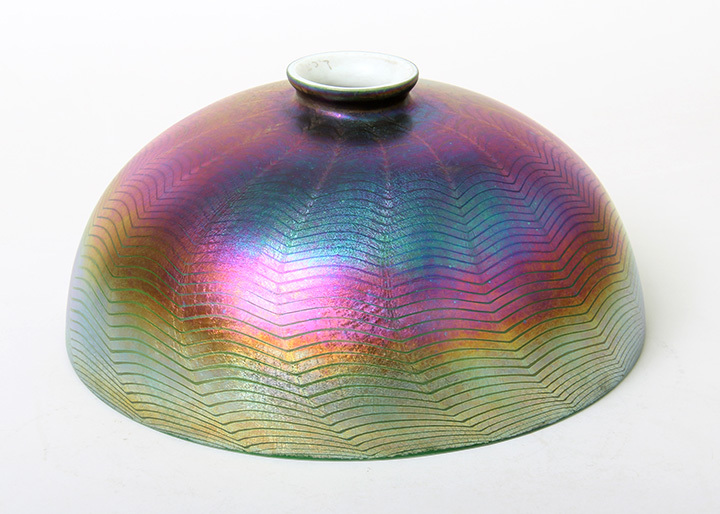 This is an outstanding example with beautifully iridescent shades. 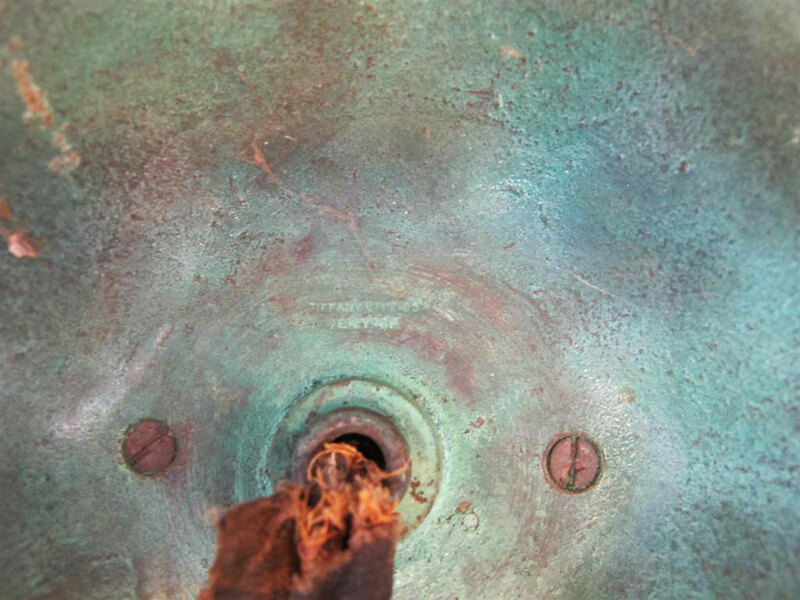 The switch is original as it's a little earlier than the metal leaf switch. Fully signed shades and base. Very nice gold doré finish. 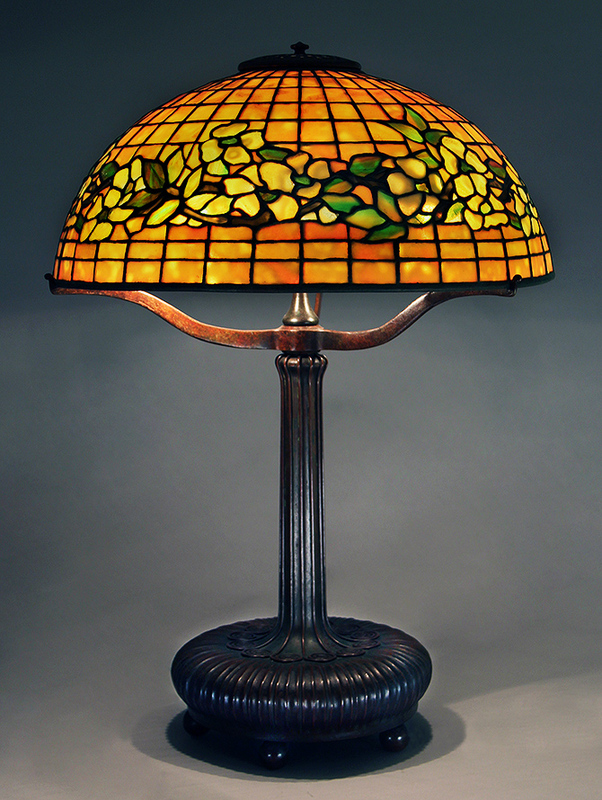 Linenfold lamps are quite desirable and this one is special. I've never seen nor owned this shaped shade before, and that makes it rare. 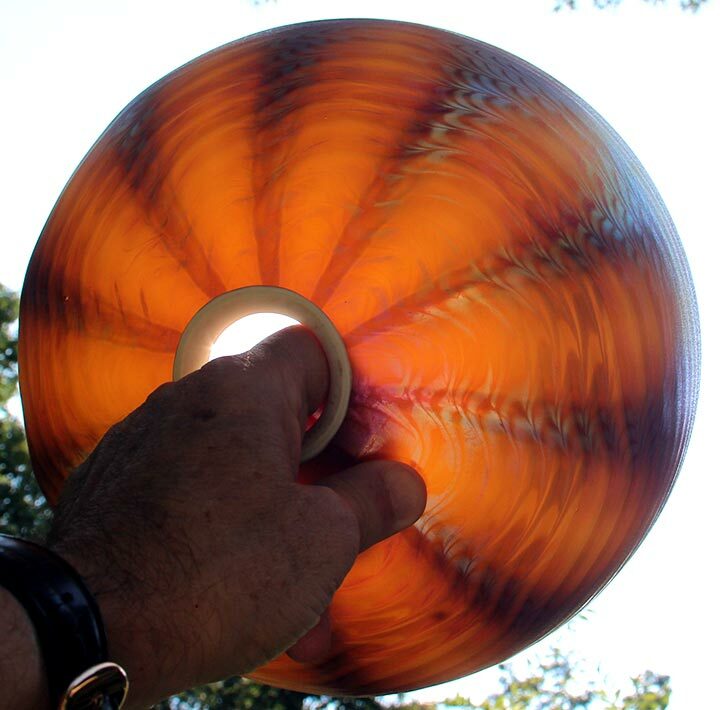 The diameter is 12¾", making it on the large side for a floor lamp. The harp is called a "split harp" or a "double harp", that Tiffany used on 12" or larger shades. Rich gold color in the shade. Wonderful condition. Signed shade and base. 14" diameter Acorn. Very unusual and desirable variation of a standard Acorn. 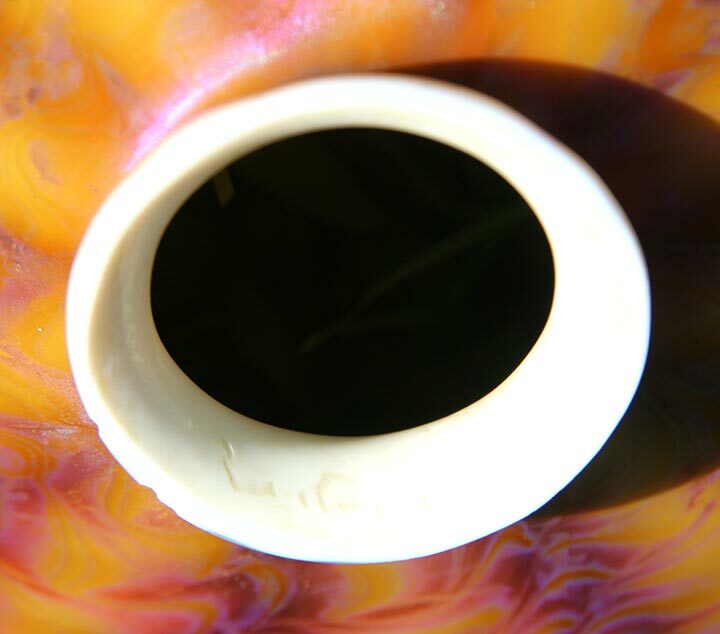 The background of the Acorn band is different glass than the geometric background of the rest of the shade. Very pretty with strong mottling. Excellent condition shade with a few lines. Excellent patina "torpedo" base. Fully signed. 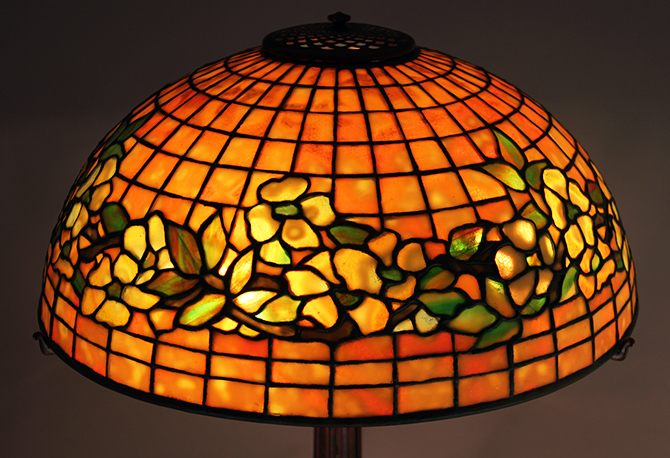 Tiffany Studios made some lamps with simple backgrounds as a canvas for great colored subject matter. 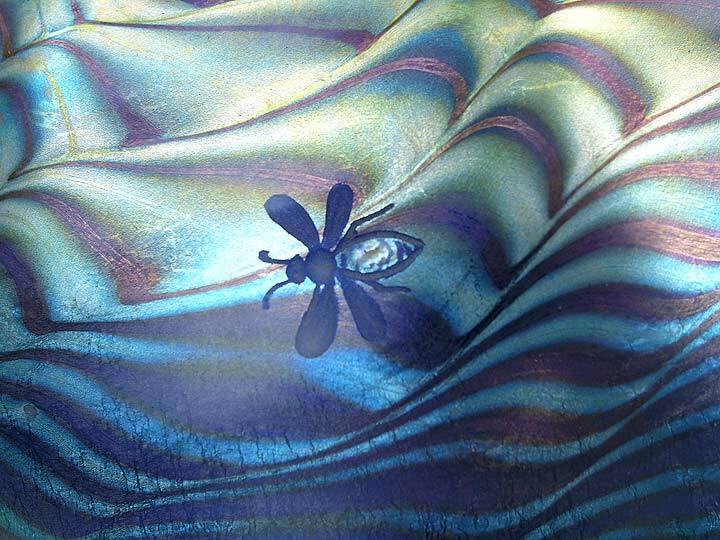 In this example, the dragonflies have super color and contrast beautifully with the complementary background. 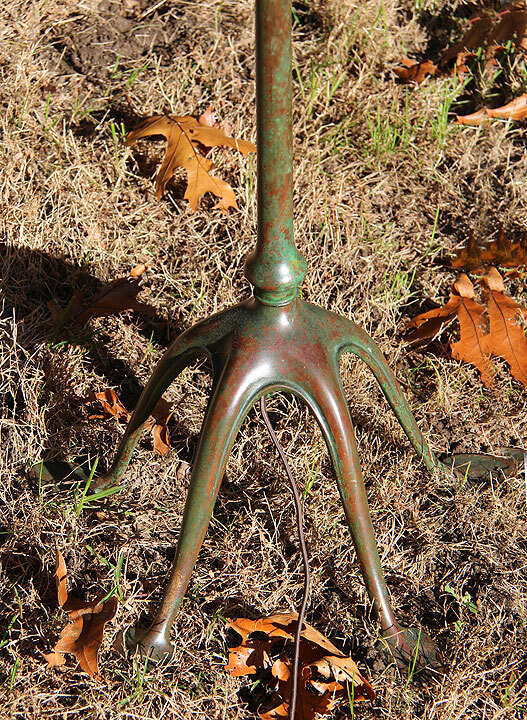 The base is the wonderful and very desirable inverted mushroom, with really great original patina. 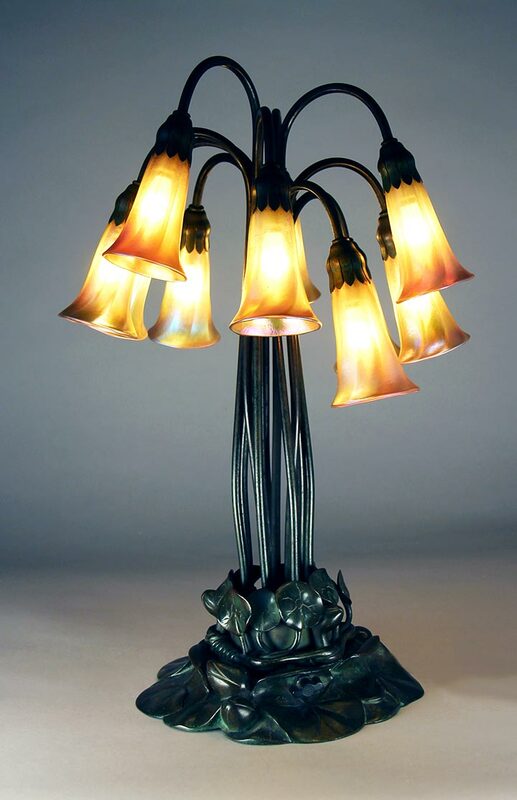 All in all, there are no excuses that have to be made for this lovely lamp. 14" diameter. Excellent condition and fully signed. 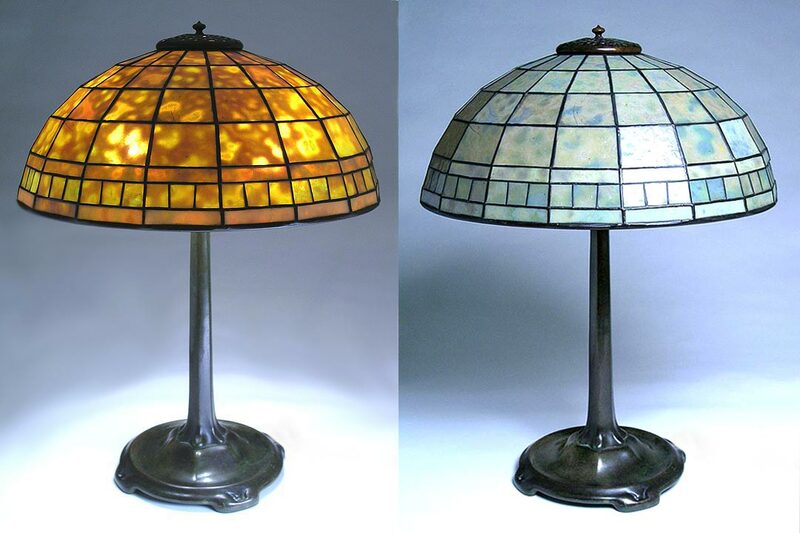 Tiffany Studios made some lamps with simple backgrounds as a canvas for great colored subject matter. 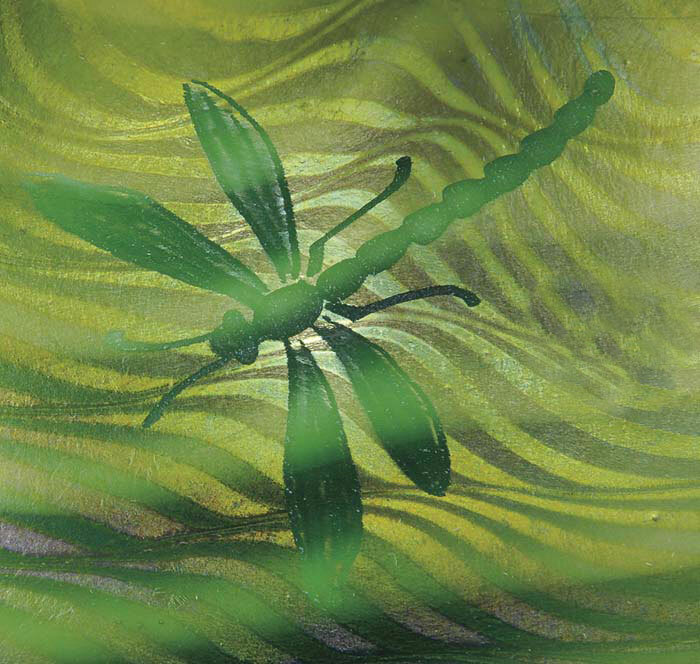 In this example, the dragonflies have lovely color and contrast beautifully with the complementary background. The base is the very desirable tree trunk, with an excellent original gold doré finish. 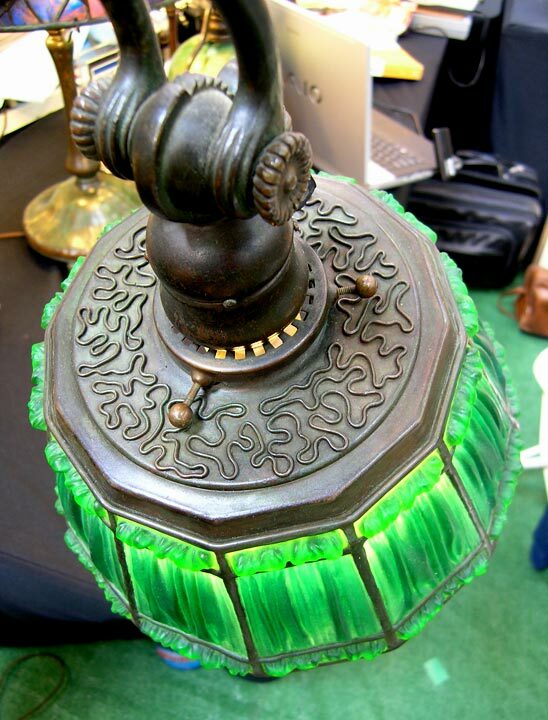 This is a fine, all original lamp. 14" diameter. Excellent condition and fully signed. I don't often sell Tiffany Acorn lamps. Most of them are not the quality I'm looking for. This example is the opposite. The color is strong apple green with fantastic mottling in the acorns, as well as the background. 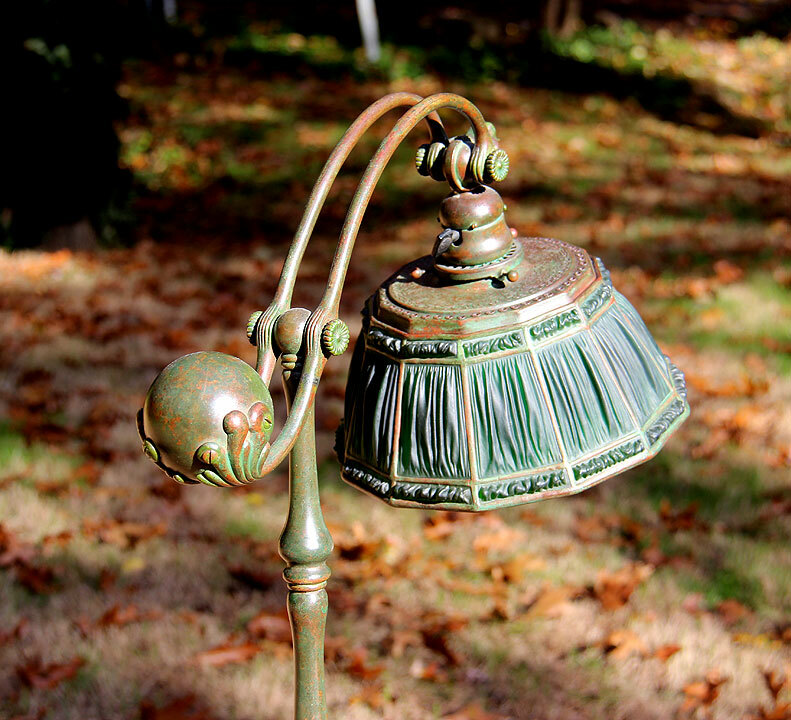 The Art Nouveau stick base is the proper base for an Acorn, with a fabulous original patina. 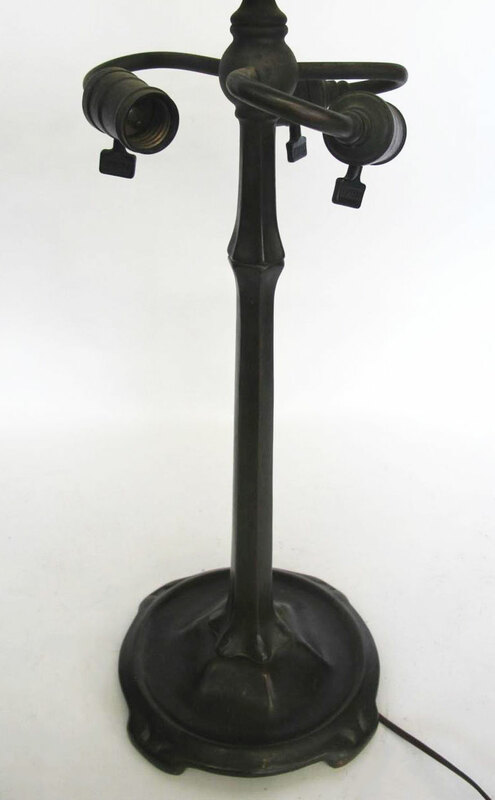 16" diameter x 20½" tall. Signed shade and base. Very few hairlines in the shade. 16" diameter Acorn. 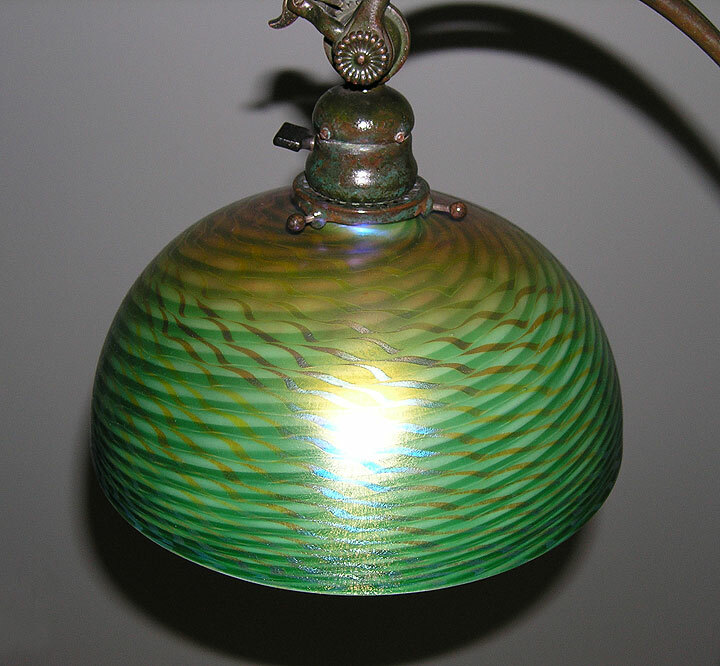 Beautiful mottled apple green shade in super condition with no damage or restoration and a great original patina. 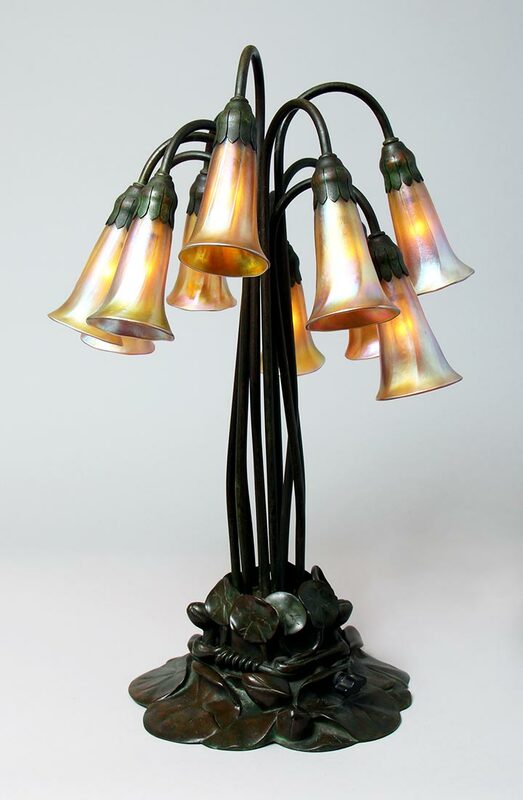 On a very good Art Nouveau stick base with statuary bronze doré finish. A strong example of the Acorn pattern. Signed shade and base. 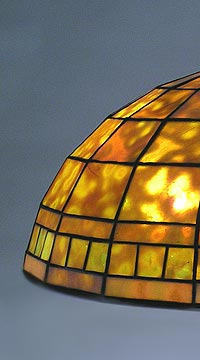 Everyone needs an entry point if they want to start purchasing authentic Tiffany Studios lamps. 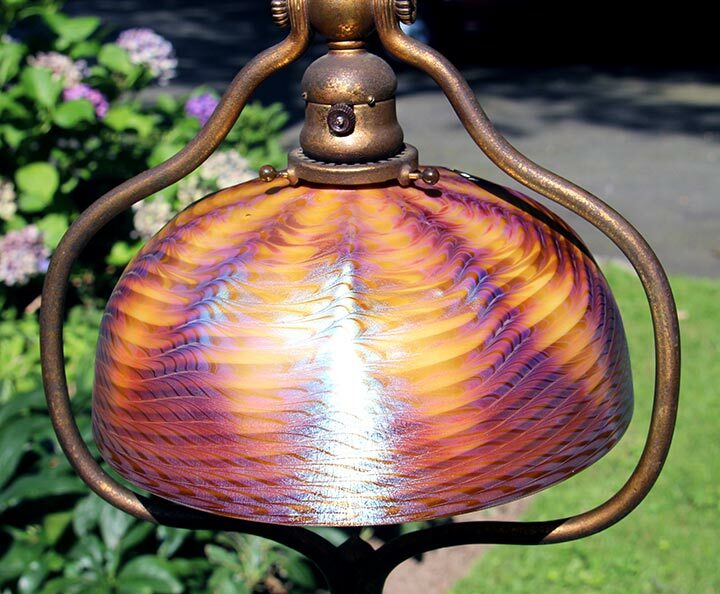 This 16" diameter Acorn table lamp is just that -- a very nice quality lamp with attractive glass on the correct base with a rich patina. Signed shade and base. Very few, if any, hairlines to the shade. Excellent condition base. 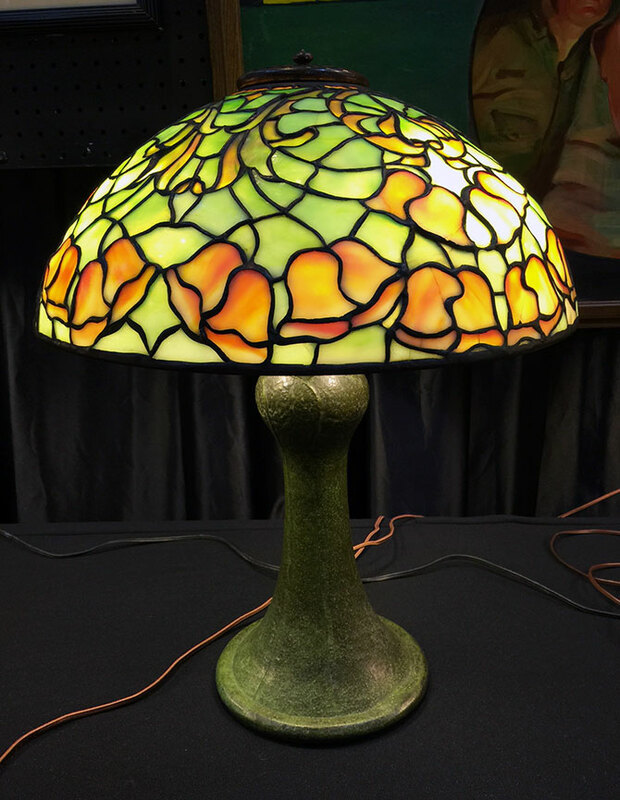 Priced super right for an authentic lamp in excellent condition. 16" diameter Apple Blossom. This is a particularly fine example of the apple blossom decoration. The apple blossoms themselves range in color from pink to hot pink to white mottled, all with yellow centers. Most of the leaves are translucent green with streaks of salmon running through them. The background shades from off-white to medium green. 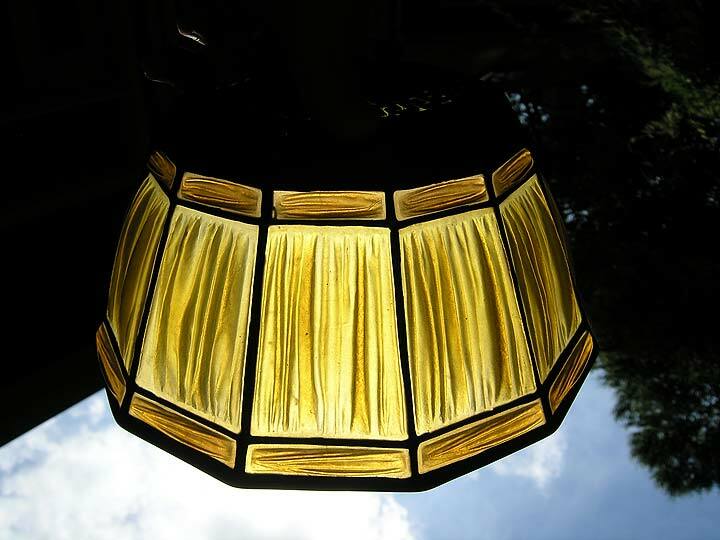 The condition of the lamp is nearly pristine with only one or two tiles having hairlines. The patina on the shade and base is a rich green-brown - just what the doctor ordered. Signed on the shade and base. 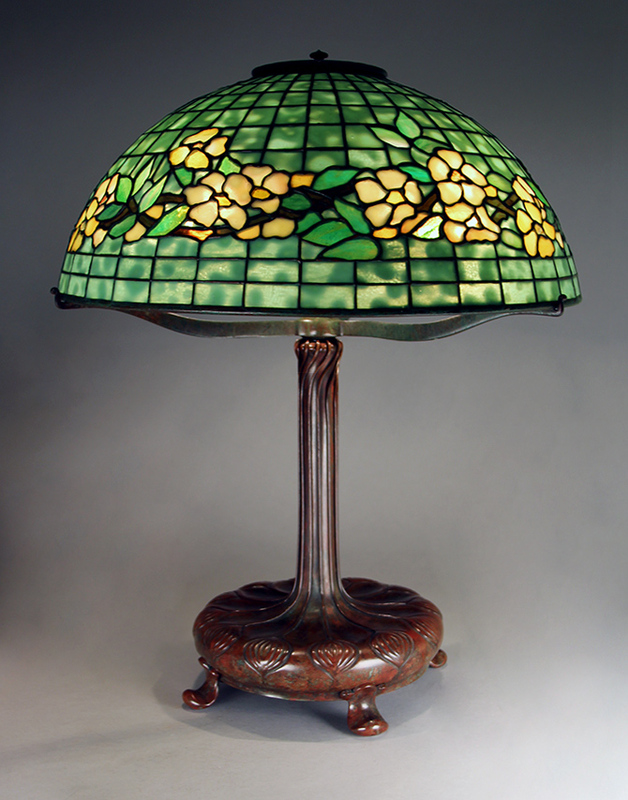 This is a wonderful entry-level lamp for collecting Tiffany, with entry on the second level, not the first. 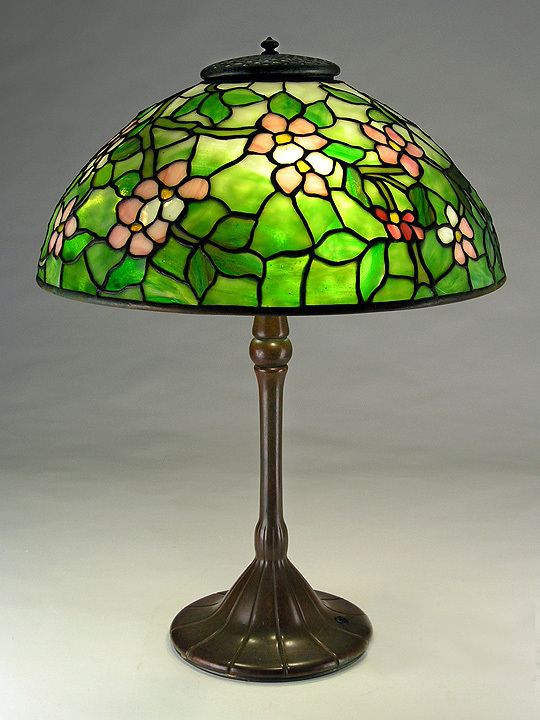 Beautiful example of a Tiffany 16" Apple Blossom. 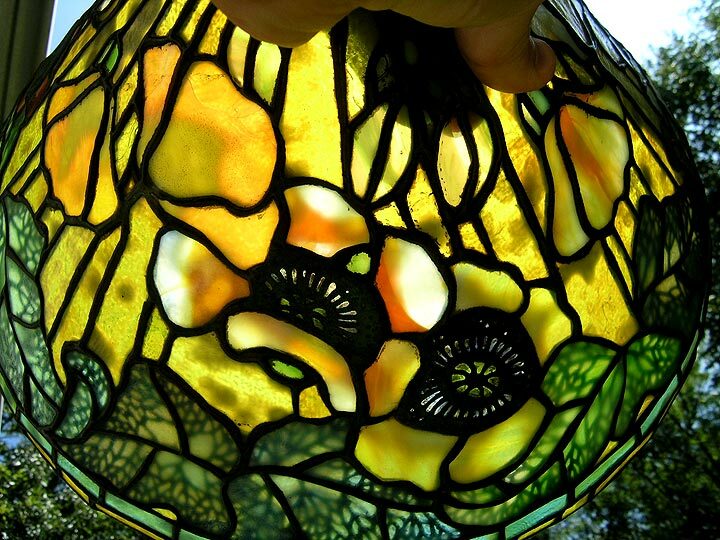 The flowers have lovely color and textured glass, with ripple glass yellow centers. The branches have very unusual and beautiful glass. The fine library base has an extraordinarily rich and beautiful original patina. The shade is in very good condition, with a few scattered hairlines. Signed shade and base. The price is quite reasonable, so please inquire. 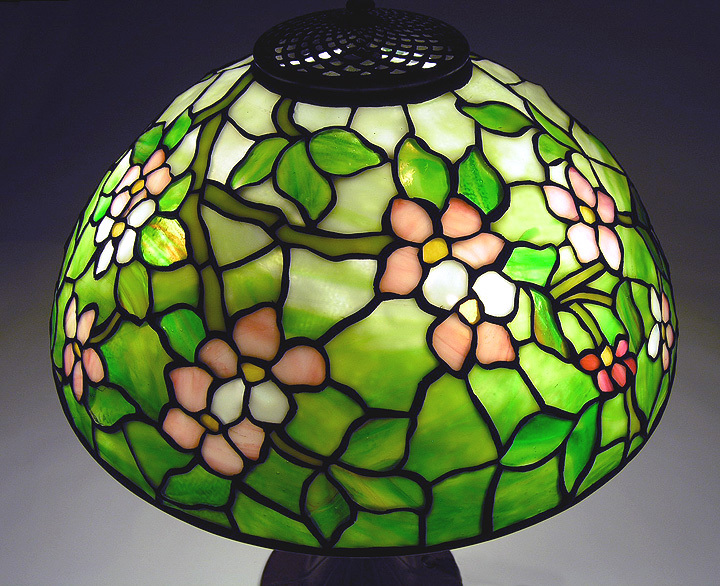 16" Apple Blossom table lamps are another example of a great entry point for collectors. This particular example has very nice color, is in excellent condition and has an important library base, with superior patina. All at a reasonable price. Signed shade and base. 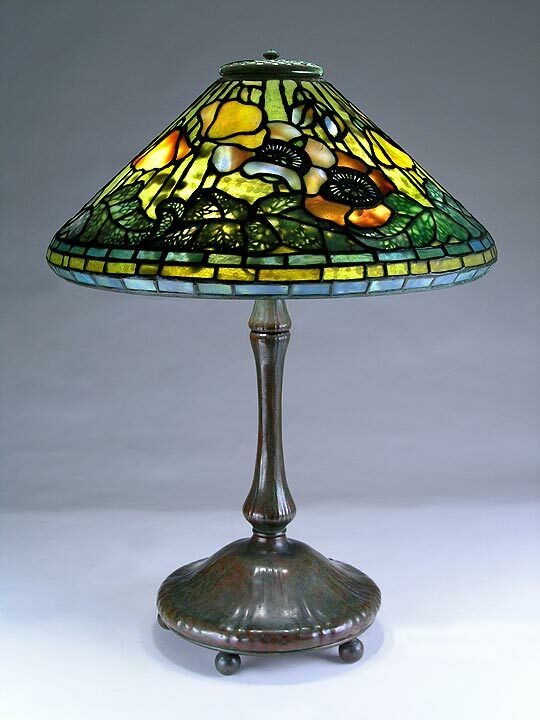 Tiffany Studios occasionally worked together with Grueby Pottery to create lovely Arts & Crafts lamps. 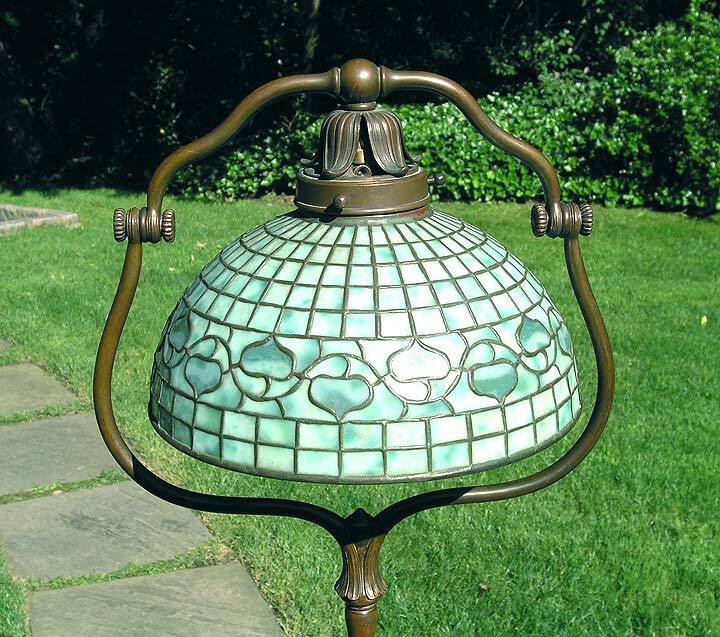 This 16" diameter Bellflower works beautifully with the base, which has a very fine, deep green glaze, and sculpted leaves at the top. The color in the bellflowers is especially nice. Excellent condition, except for a few hairlines in the shade. Signed both shade and base. 20½" tall. 16" diameter Belted Dogwood. I just got this great bunch of lamps, one better than another. The colors in this Belted Dogwood are so pleasant and unusual. The flowers are amber with strong mottling and with yellow or orange centers. The background is beautifully shaded from lemon yellow with touches of salmon in the mottling to a brighter yellow at the bottom. The base is an important library base with a nice brown patina. All in all, a beautiful package in very fine condition. The shade is almost mint with what appears to be two tiles in the background with lines. Signed base and shade. 16" diameter Crocus with beautiful mottling. A fine example of the Crocus design. 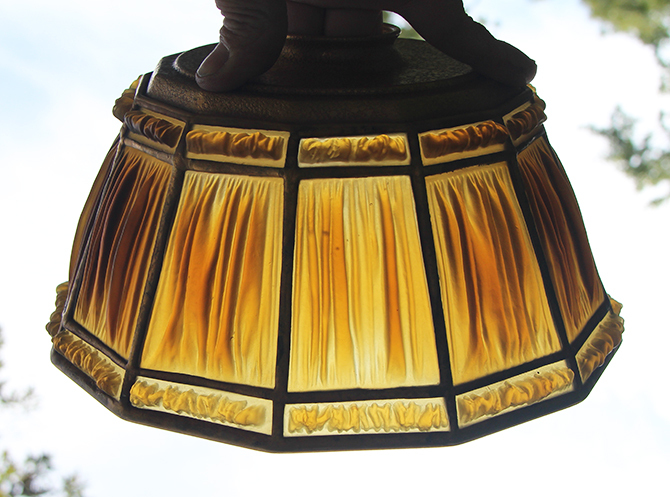 Excellent condition shade with no restoration. Excellent patina base. Signed shade and base. 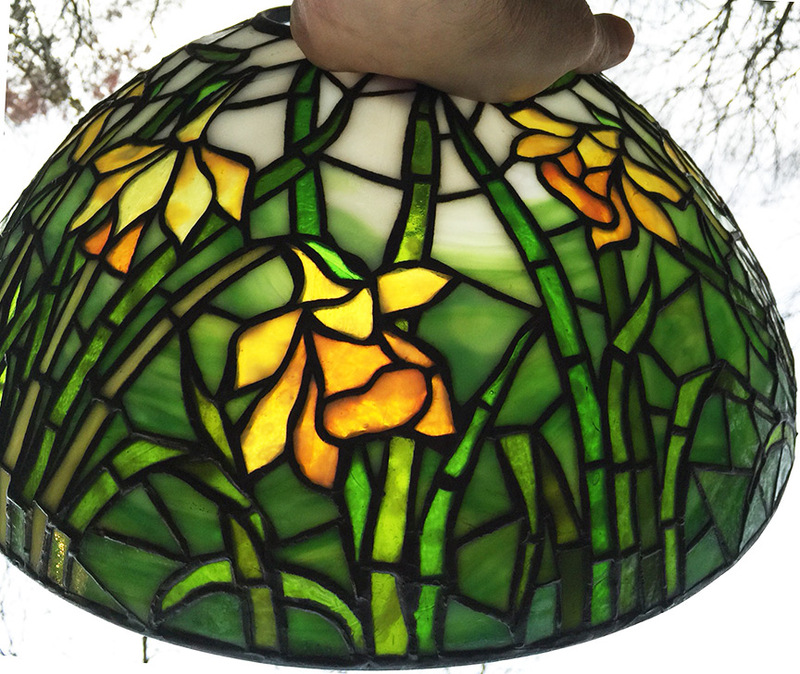 Over the years, I've sold many examples of Tiffany Studios Daffodil lamps. 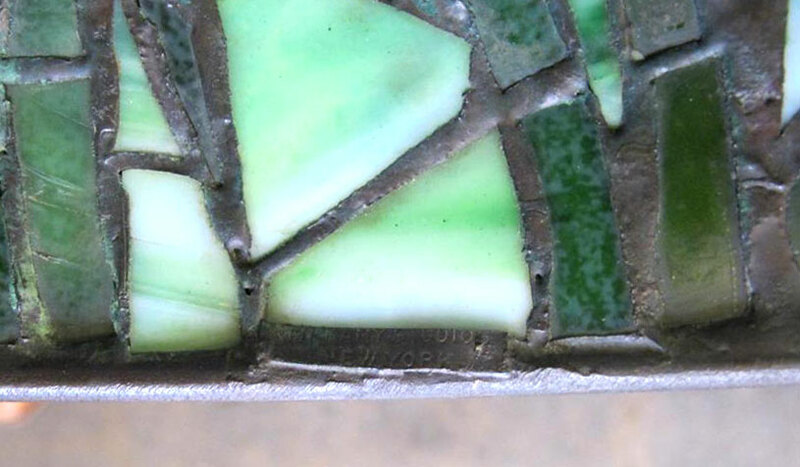 This is one of the better ones, with excellent color, fine condition and very few cracked tiles. 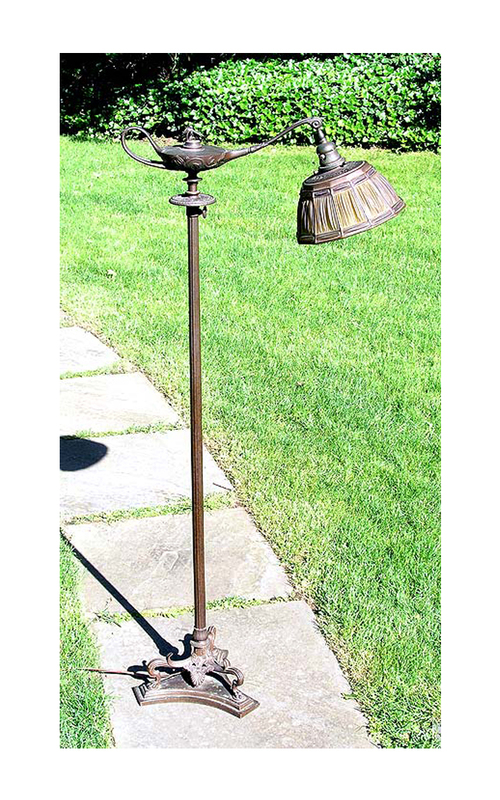 Beautiful library base with mock turtleback decoration and an excellent patina. 16" diameter x 21½" tall. Signed base and shade. 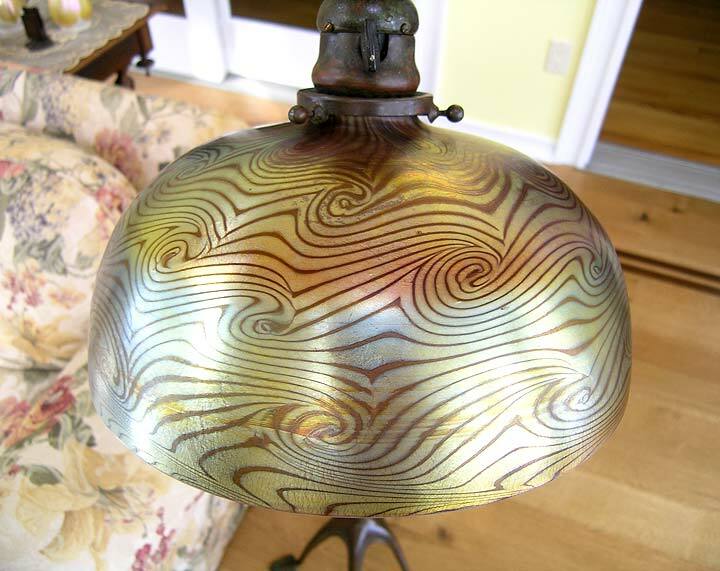 I've owned Tiffany Studios 16" diameter Belted Dogwood table lamps many times before, but this one is special because of the great color and fiery red-orange mottling. 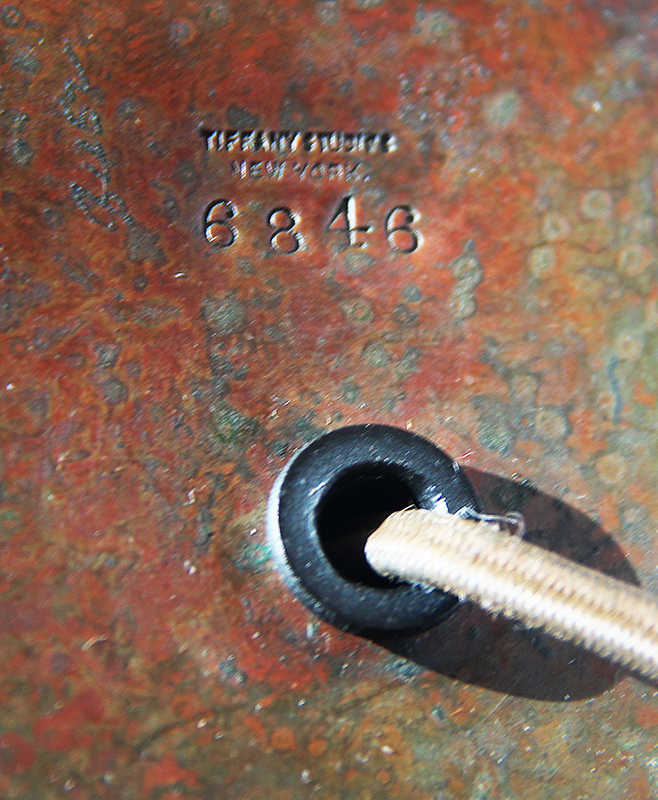 With this great library base, and a rich, original patina, and you have one fine package. Signed base and shade very few, if any hairline cracks. It's a great lamp. 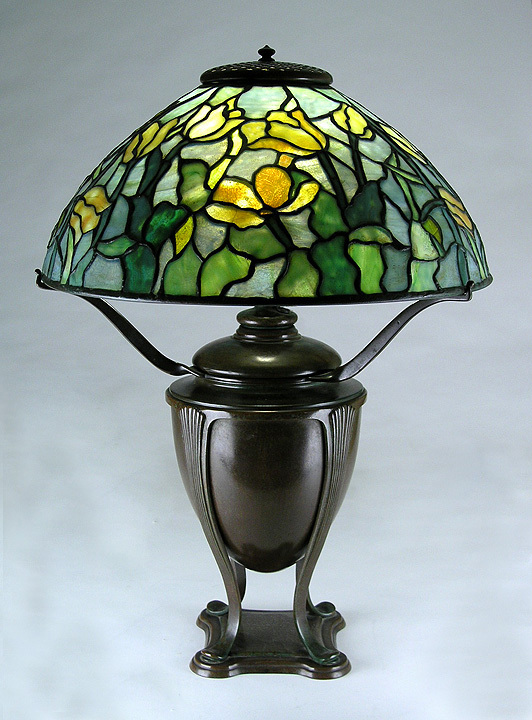 Tiffany Studios 16" Pansy table lamps usually have anywhere from good to excellent color. 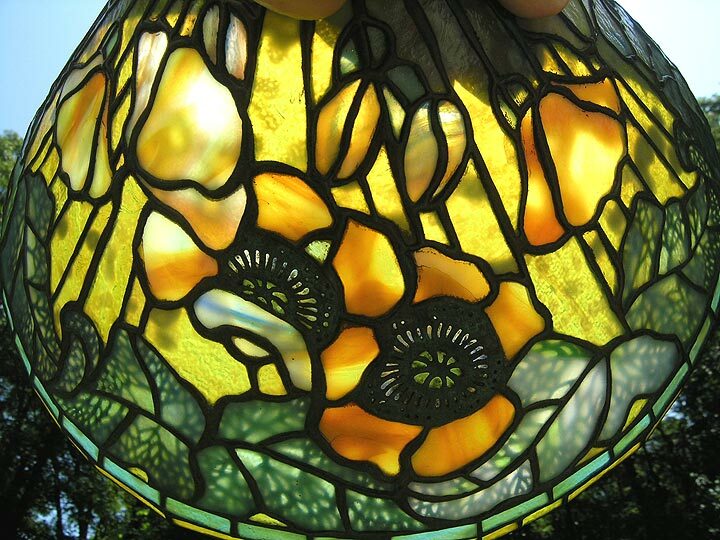 The flowers are what makes the lamp special. Usually they have great color and mottling, as in this example. The base is also super with a rich patina, heavy in green. Great condition with very few hairlines. Signed shade and base. 16" diameter Pomegranate. The Pomegranate decoration is rarer than the more common Acorn decoration. 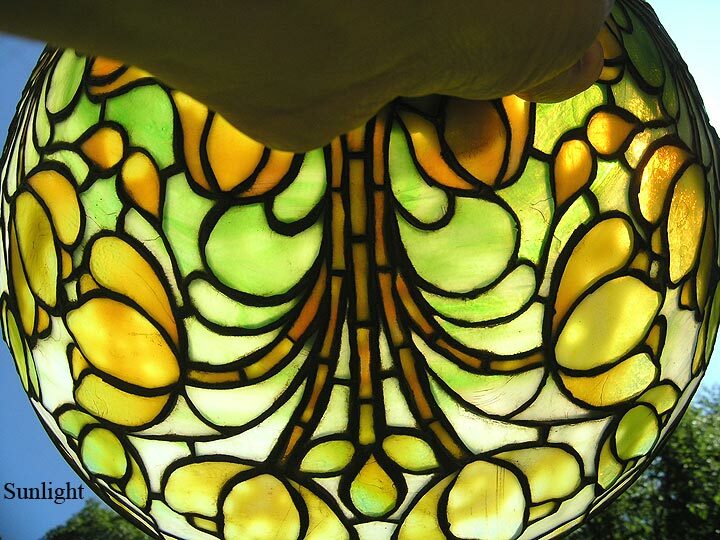 This example has beautiful shaded glass. It's in near mint condition with no restoration. 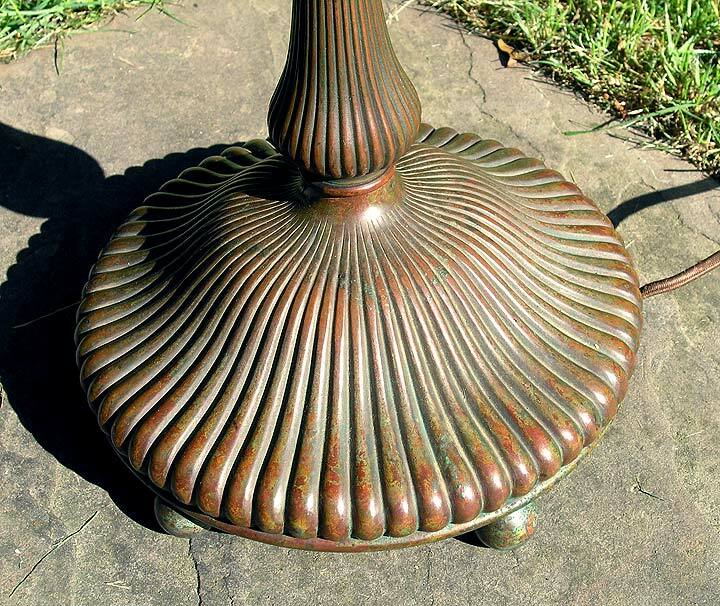 The Art Nouveau stick base has a great original patina. The overall condition of this lamp is a 10. 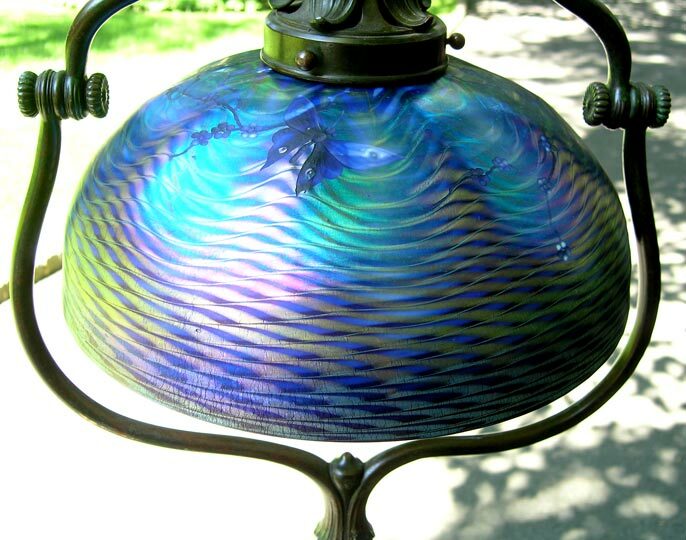 A beautiful lamp to add to or begin a collection. Signed shade and base. 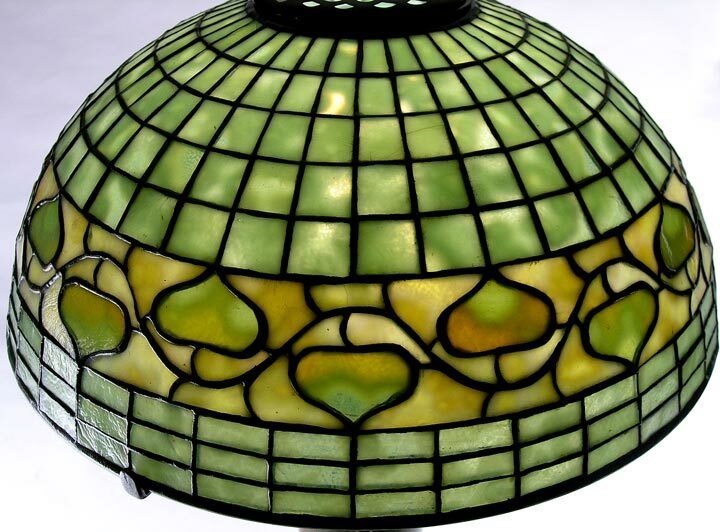 I don't often buy Tiffany Studios Acorn or Pomegranate lamps, but occasionally a special example comes along. This orange Pomegranate is rarer and more desirable than green examples, and rarer than an Acorn. The color is rich and beautifully shaded from darker at the top to lighter at the bottom. The Pomegranates are beautifully mottled in a complementary, soft shade of green. The condition is great, with very few, if any, hairline cracks. 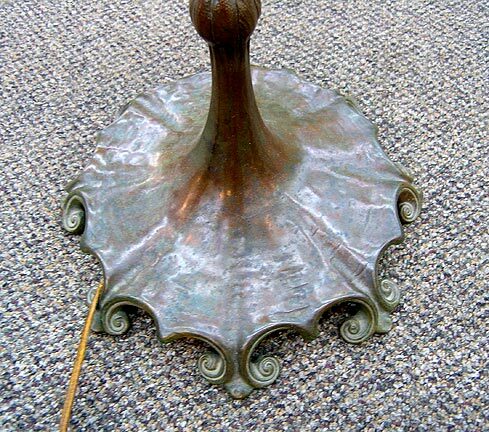 The Art Nouveau stick base has a beautiful original patina. 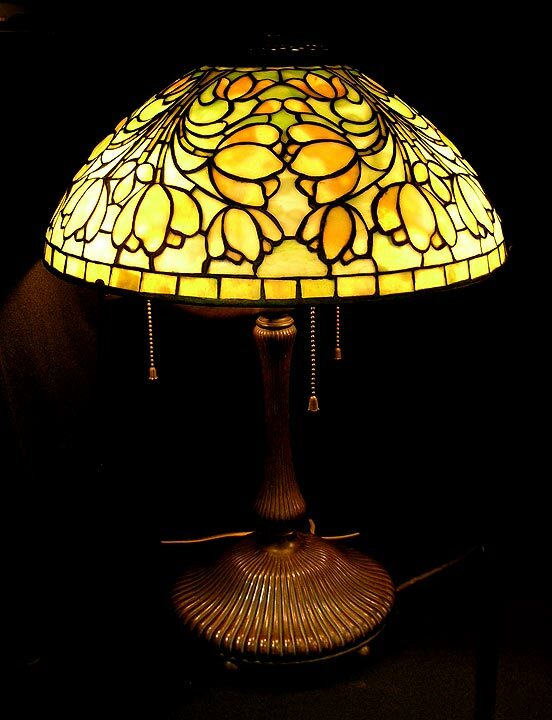 The lamp is perfect for any collection, but will look especially nice in an Arts & Crafts setting. 16" diameter. Signed. 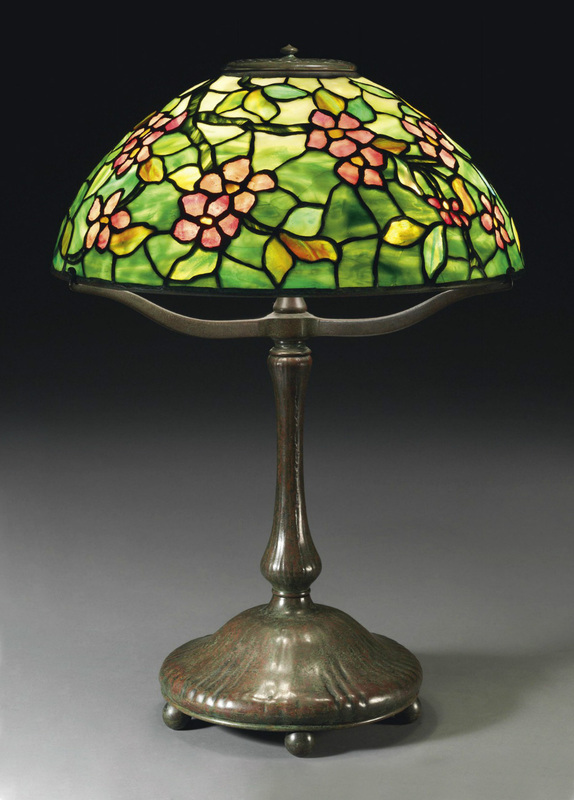 Tiffany Studios Pomegranate lamps are not nearly as common as Acorn lamps. 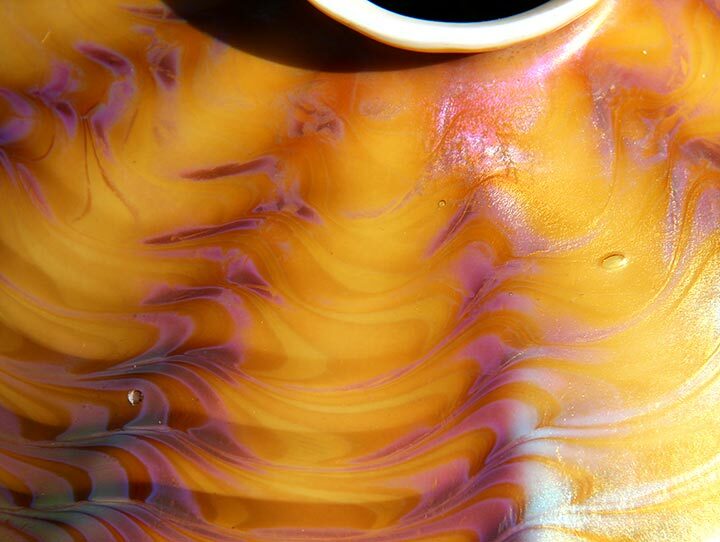 This particular example has beautiful color and great mottling. The condition is excellent with very few cracked tiles. Both the shade and base have excellent patina. 16" diameter x 21½" tall. Signed shade and base. 16" diameter Tulip. Pretty yellow tulips that vary from lemon yellow striated to deeper yellow mottled against a very attractive blue-grey sky background. Very nice leaves and stems in varying shades of green, some mottled. All in all, a very fine shade. 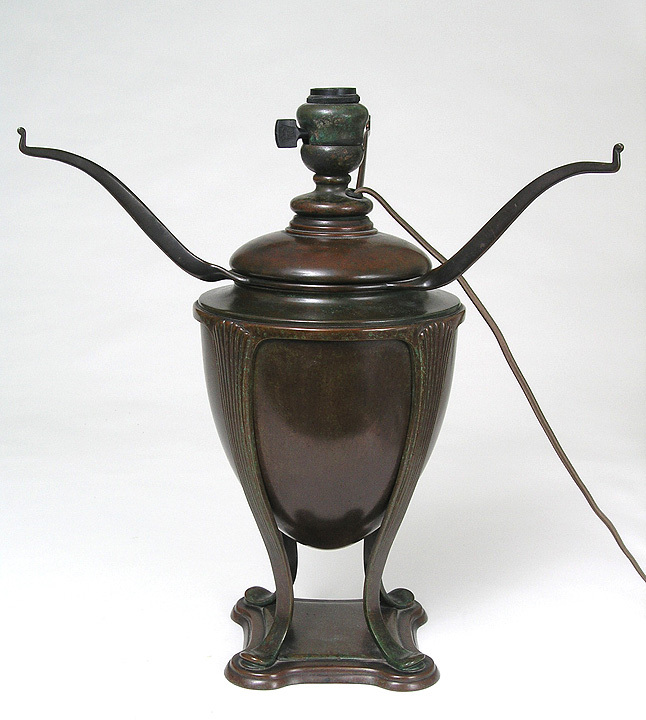 The lovely base is of Greek Urn design with a very fine green-brown patina. 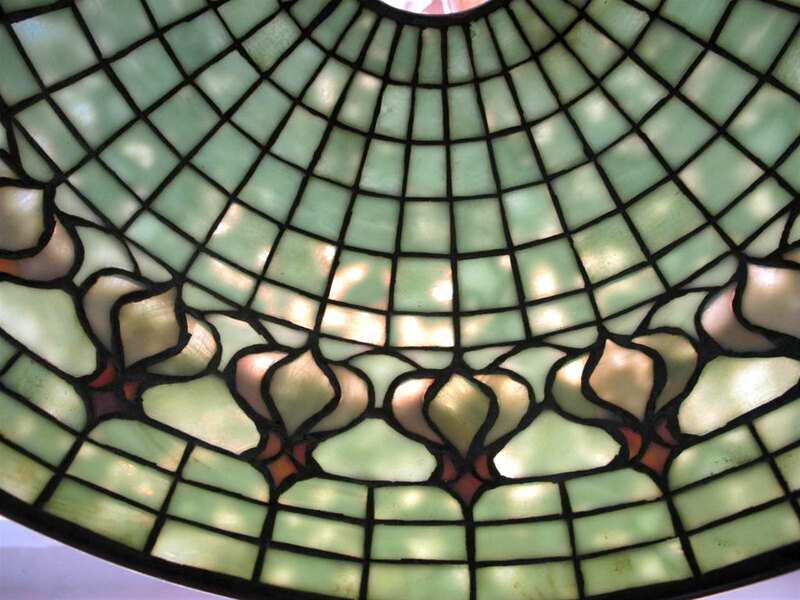 The shade is in very good condition with approximately eight scattered tiles with lines. Signed base and shade. 16" diameter Woodbine decoration. What can I say that you can't see? 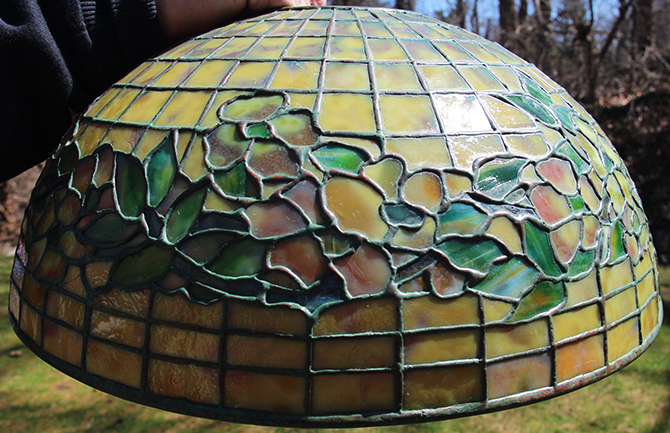 This is one of the most beautiful Tiffany lamps I've ever had the pleasure of offering for sale. This type of shade is called a "Four Seasons" variety because the colors change as you go around the shade. In this example, the colors of the background change from gorgeous sky blue to purple. The flowers are beautiful earth tones changing from red-orange to burnt sienna, some with great mottling. 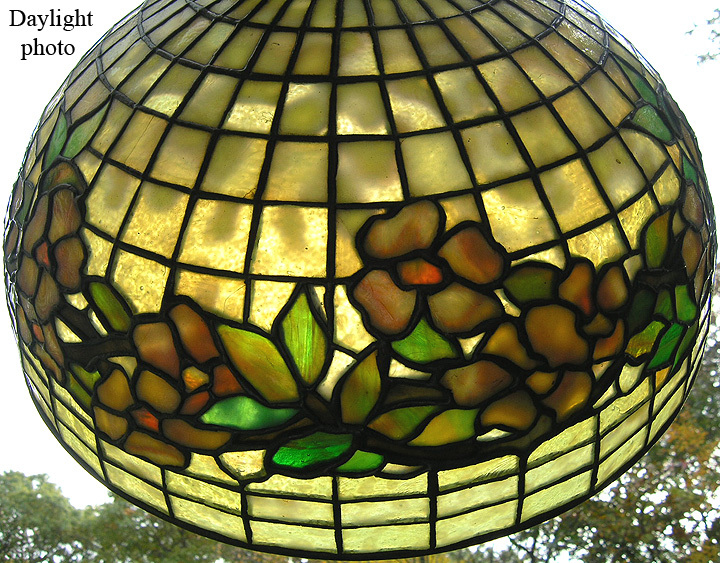 Some of the flowers appear to twinkle in the light because they are textured on the interior. The leaves are done in various shades of green, some with strong mottling. The beautiful library base has a fantastic original patina with strong green tones. 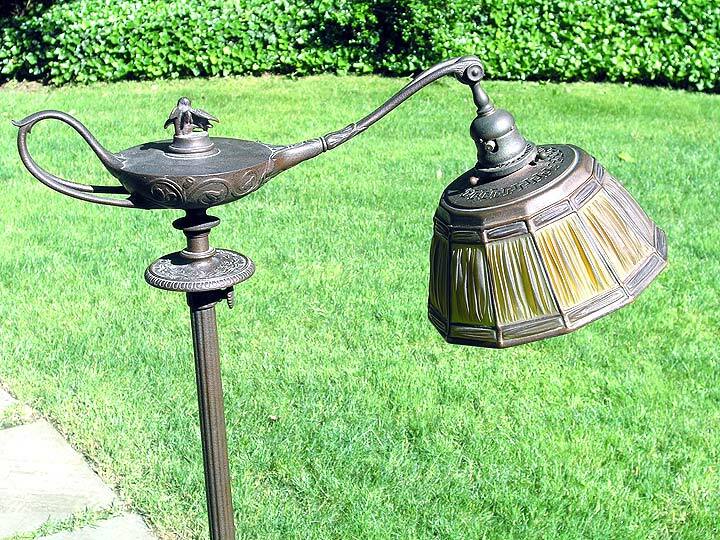 Overall the condition of the lamp is superb. 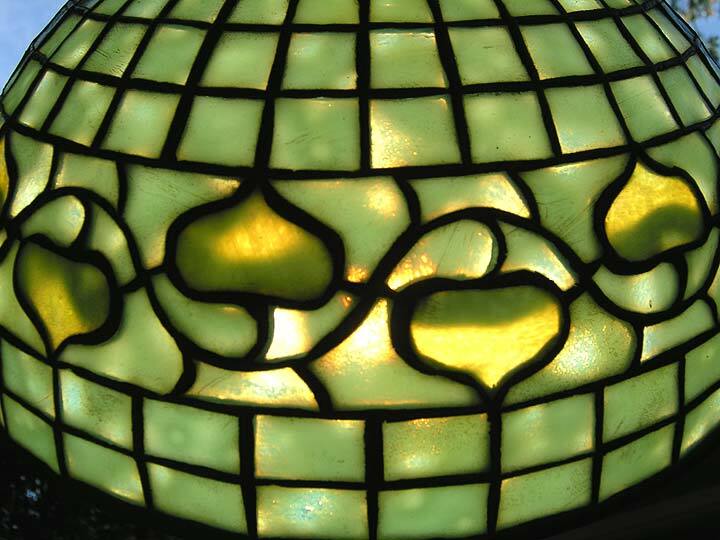 There are 5-6 scattered tiles with single lines, perfectly normal for a lamp that's approaching 100 years. It's signed on the base and shade. I promise you this lamp will not last long. Act quickly if it's for you. 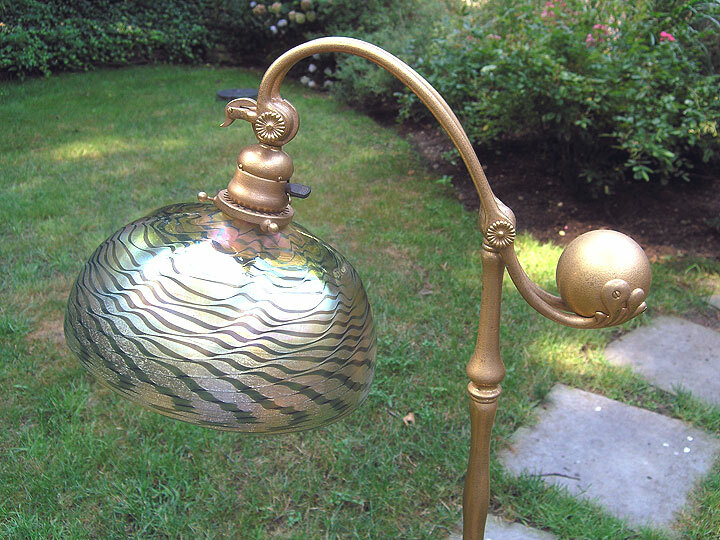 I'm thrilled to have this lamp for sale. It's killer. Let's start with the dragonflies themselves. They're great with olive to gold mottled bodies, jeweled eyes! and yellow wings. 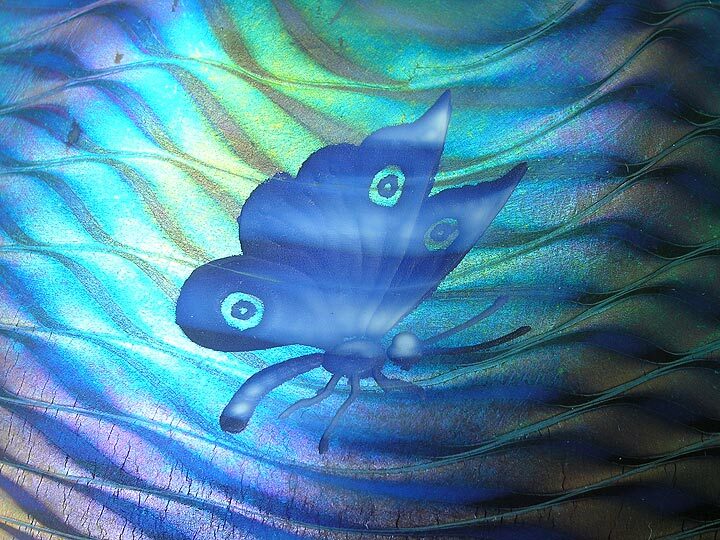 The background glass is all ripple glass shading from blue to mauve (how great is that!) 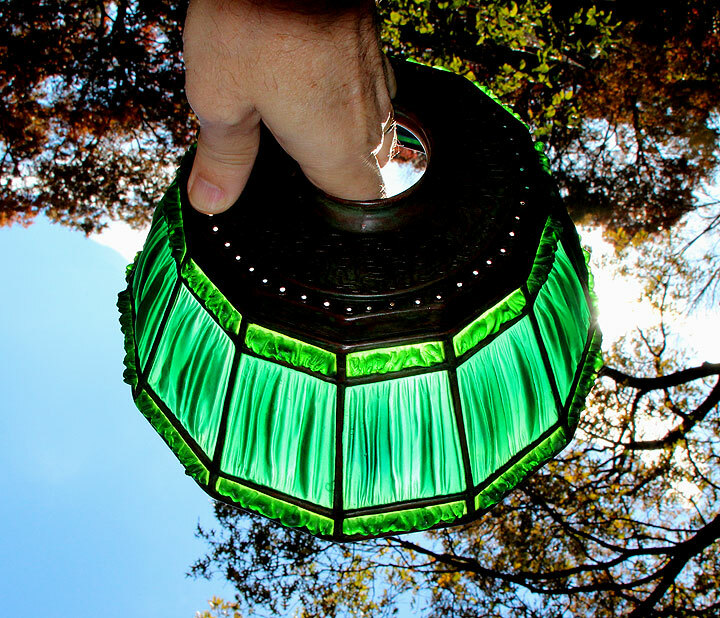 with green bordering the top and bottom of the shade. 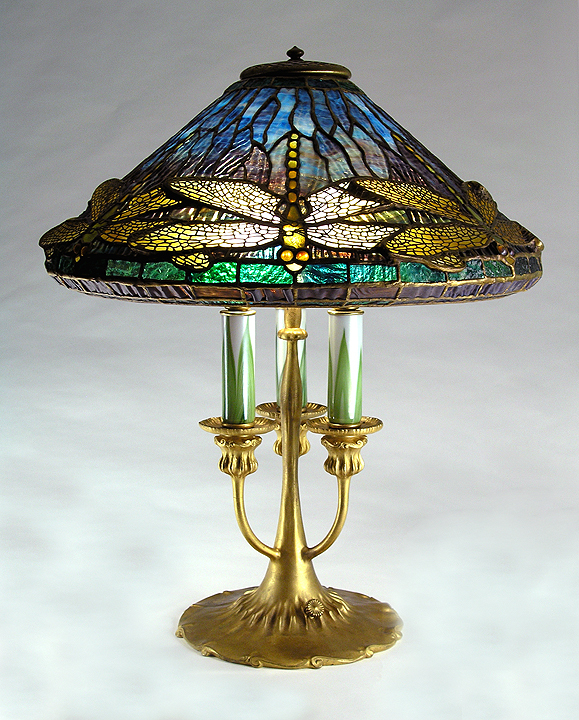 The base is fabulous too -- a rare candelabra base with pulled feather Favrile glass inserts. 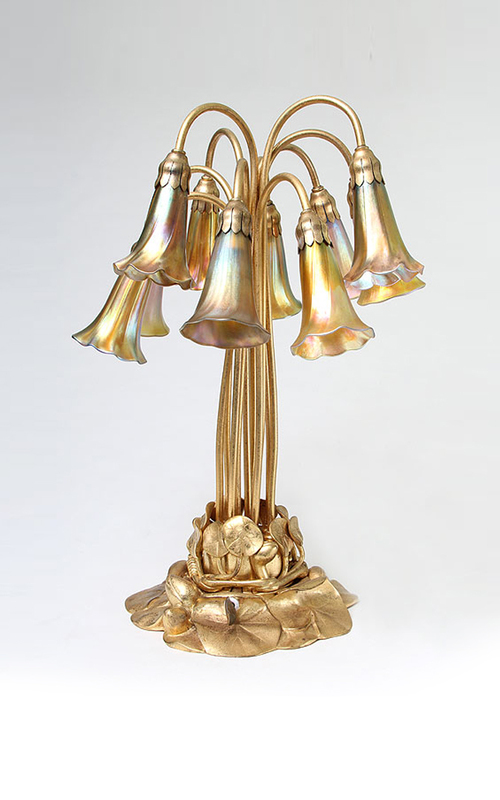 The whole lamp is original with a gold dore finish. It will not last long. It's signed base and shade and in excellent condition. 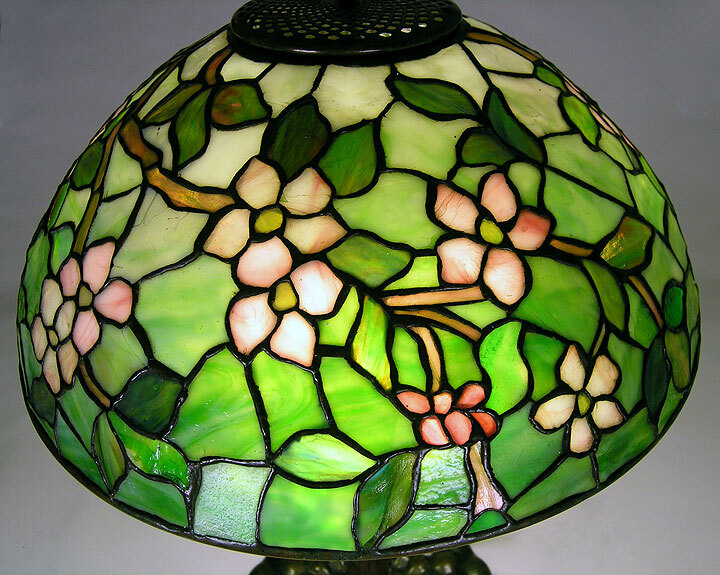 Belted Dogwood is a very pleasant Tiffany Studios design. It's much rarer and more desirable in this 18" diameter version than the similar 16" diameter version. 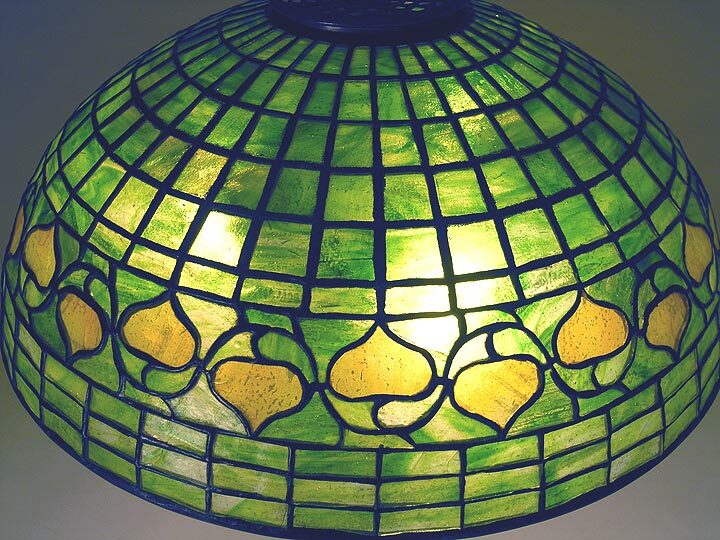 The glass has beautiful yellow mottled flowers against a highly mottled apple-green background. As far as I'm concerned, the more mottling, the better. 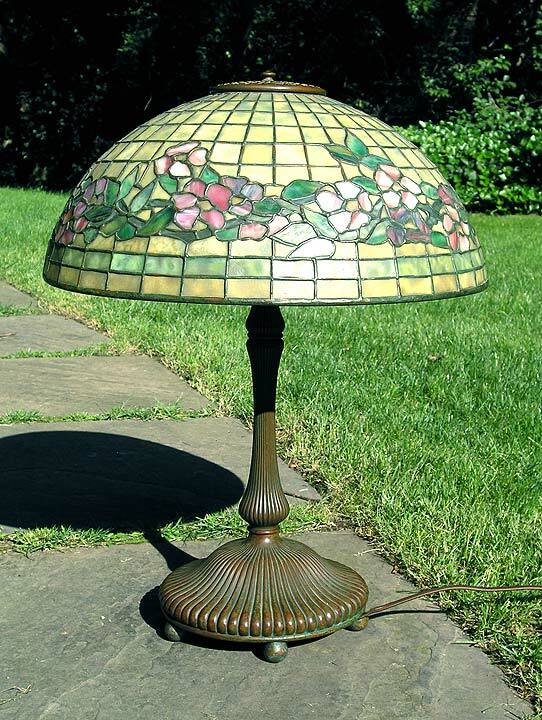 The shade is in excellent original condition, with very few cracked tiles and no restoration. The very good library base has an original, rich green-brown patina. Signed on both the shade and base. This lamp is just in. It's a beauty and clean as a whistle. The dogwood blossoms are multi-color on a fabulous background, shown in the detail photos available if you click on the thumbnail photo on the left. I'll add more photos in the next few days. The shade is 18" in diameter, so it's larger than the more common 16" version. The patina on both the shade and base is wonderful. This is a really special table lamp, moderately priced. Superb original condition. Signed shade and base.